Not available as yet... Shipping Dimensions:for how to programe see..... https://www.youtube.com/watch?v=m0Kzi7mo2pI. 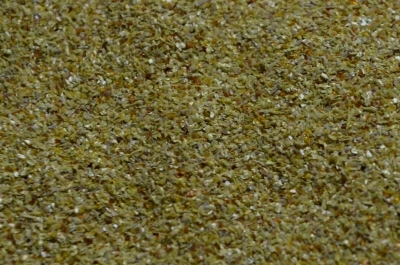 350gm for BEADGLASS LAVA FLOW BEAD RELEASE READY MIXED see the next product below this post. Mixed with water this Bead Release makes 830gm of Bead Release! 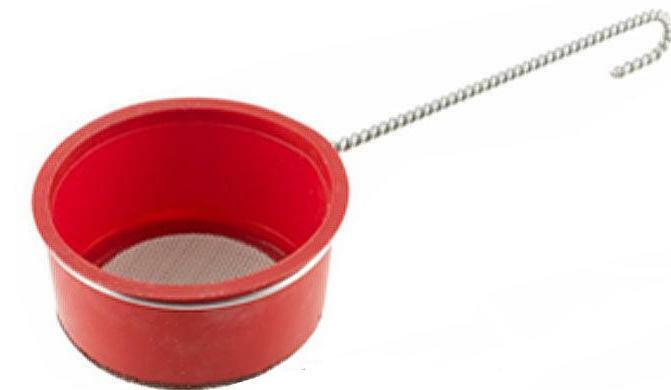 This is supplied as a dry powder bead release (cheaper to mail) Just mix with water! 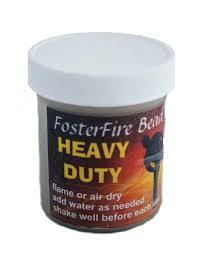 Easy to use and quick drying,durable in the flame,will hold agressive marvering and heavy beads yet releases with ease. Supplied with directions plus a list of tips for cleaning bead holes out perfectly clean. 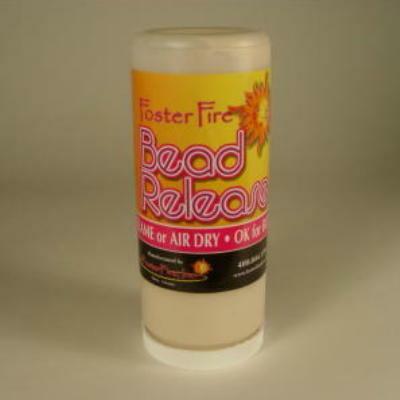 To keep your beads spotless with no unwanted imbeded oxides, which often appear after firing....PRECLEAN your rods with Sparex, Rio Pickle or Nontoxic alternatives which include combinations of alum and water or vinegar and water. 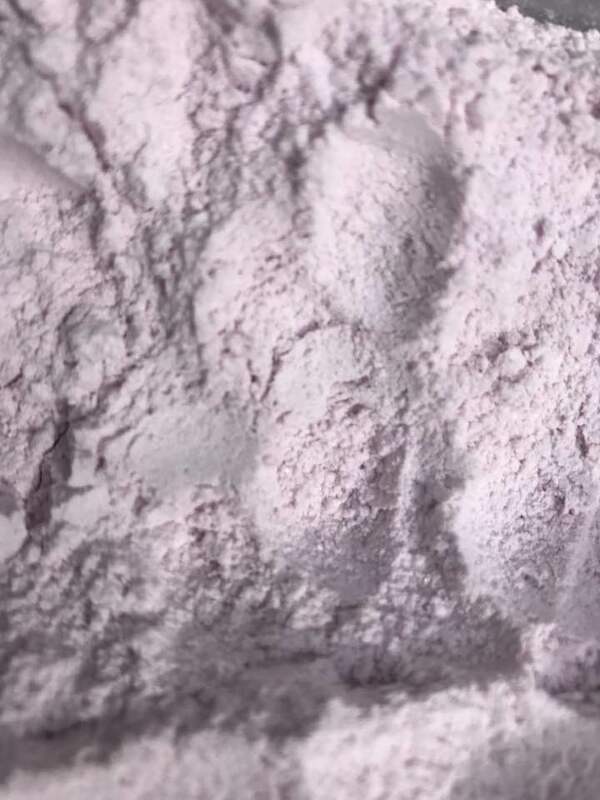 To make a solution from alum, dissolve 1 tbsp of alum in 1/4 cup of water. Make a vinegar-based solution by placing water in a saucepan and adding distilled white vinegar. Heat the solution until it simmers, then add a bit of course table salt. The ratio is about one part of salt to eight parts vinegar. 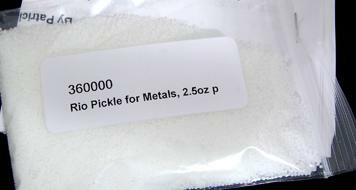 Nancy Hamilton has a very informative page relating to Pickle and the various types available at: http://www.nancylthamilton.com/techniques/soldering/on-pickle-crock-pots-and-baking-soda/ More helpful hints are included with this product. 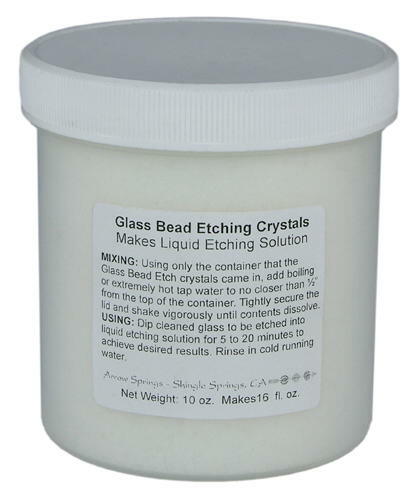 in Stock!Etches large & small beads. Using GLOVES,submerge between 1-5 mins.for over-all matt finish. Use the Resist Gel to mask out areas first that are not to be etched.This is a reusable product and will create a frosted etched look which can be left as is, or further enhanced by painting or enameling onto the etched surface.A reusable liquid matting solution that will provide a beautiful matte finish to any transparent, translucent or opaque glass bead including seed beads. Dip n Etch will not harm stringing materials. 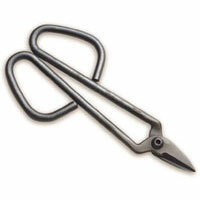 LINE YOUR BEADS WITH THIS BRILLIANT LITTLE PORTABLE TOOL! THOMPSON ENAMELS THE LIST BELOW WILL BE THE RANGE OF THOMPSON ENAMELS THAT ARE TO BE USED IN THE HOLLY COOPER POWDER PLAY CLASS. 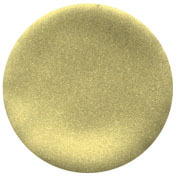 ABOUT THOMPSON ENAMELS DESIGNED FOR 104 SOFT GLASS: The 9000 series of Thompson Enamels are vitreous enamels (highly pigmented ground glass), that have been especially formulated for use with any 104 COE glass (Effetre, Lauscha, Vetrofond, etc.) 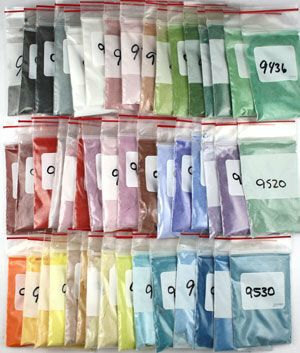 These are lead free colours that are produced in a 80 mesh, fine powder form, and can be rolled or sifted (see SIFTERS available under 'Equipment' list) on the molten surface of the glass to produce vibrant new colours,ombré effects or to alter existing colours. Thompson Enamels can also be used to produce stringers with new or multi colours too.The advantage of using an enamelled stringer is that it is stiffer than just a standard glass stringer and therefore easier to use in the heat. 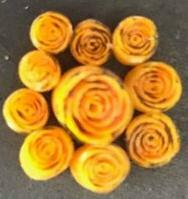 MINI TUTORIAL: After forming a molten gather roll it in enamel several times and then pull out. This stringer will be noticeably stiffer and will be slightly difficult to pull out. 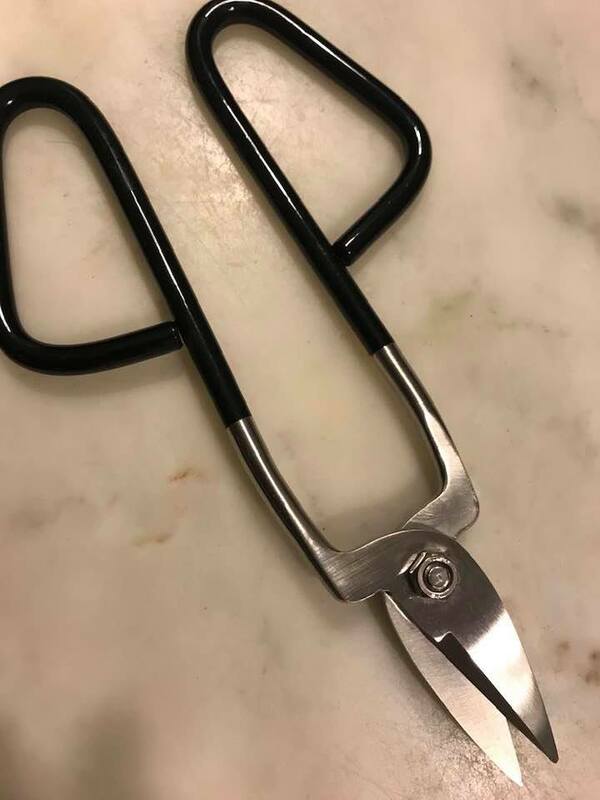 HINT: An easier way to grab hold of the gather is to grasp a smaller chunk of the glass at it's tip with tweezers or pliers,and then in the center area, reheat again and then pull out the stringer. A lightly enameled stringer will create lovely webbed effects while a heavily enamelled stringer will produce lucent color streaks. 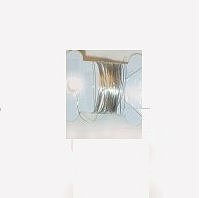 These stringers, when cold need to be stored carefully as they tend to be more brittle than standard glass stringers and break easily. TUTORIAL on Enamel Watercolour Effects: http://www.wetcanvas.com/Articles2/10208/209/ THE PROPERTIES Of THOMPSON ENAMELS And SAFETY: Enamels are made of finely ground glass that’s been modified with metals that give the enamel its color. 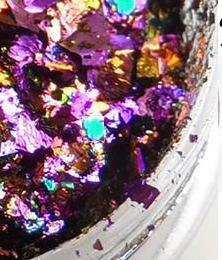 The resulting material is highly saturated, making enamel a bit more brittle than glass alone. It’s this property that makes enamel work best as a coating on metals or glass. 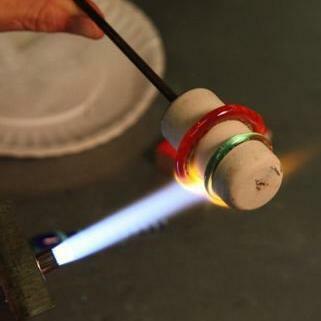 Enamels have higher working temperature than glass rod, requiring 1500° F to fuse. 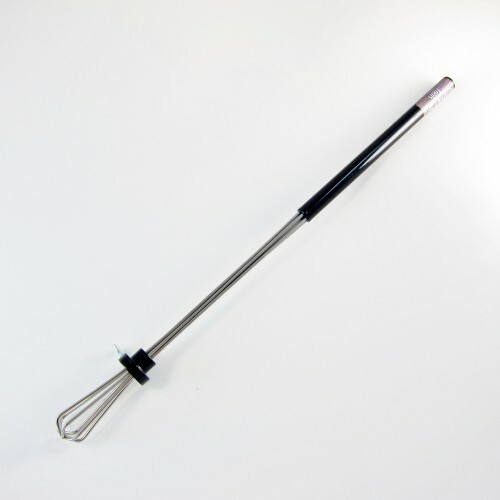 Making matters a little more challenging, they are also very sensitive to being heated quickly. Enamel needs time to process heat on the way up to working temperature or it will very easily boil. To avoid boiling the enamels bring them to temperature slowly, introducing an enameled bead into the back of the flame and gradually working forward until the enamel is fused. As we take precautions with enamel to avoid boiling, we also need to be aware of flame chemistry. 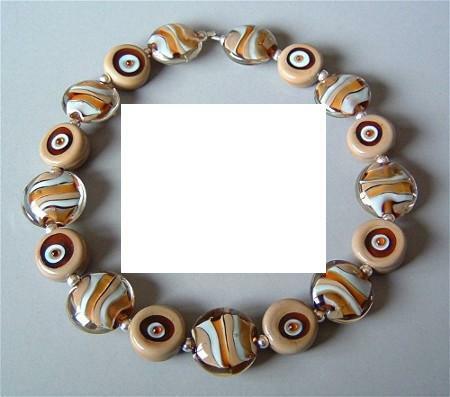 Certain enamel colors- especially the pinks, purples, and white- are more sensitive to reduction, which leaves scummy yellowish/brownish residue on the surface of the bead. An oxidizing flame, to the other end, can cause boiling. A NEUTRAL flame is your best bet. 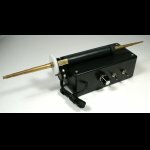 The ELECTRIC MANDREL SPINNER, Power Box 2, eliminates the motion needed by fingers & hand to turn turn the mandrel during beadmaking.This is a precision made and ergonomically well designed tool the benefits, of which, have numerous applications. 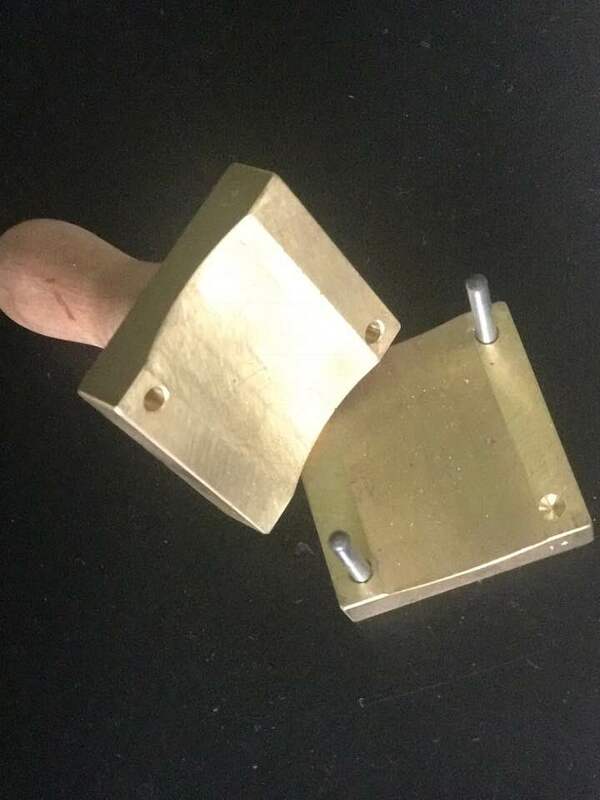 This is the No 2.Power Box which attaches to a flexible axil holding any size mandrel fom 1.6mm through to 3.2mm The mandrels are secured in brass adjustable sleeves. It runs on ONE D SIZE BATTERY,has a standard ON-OFF-REVERSE Switch. 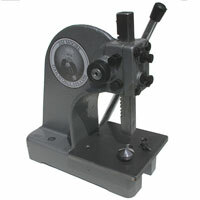 Also has a SPEED CONTROL DIAL (Rheostat) which will help you 'SET' the speed you want to make beads including the amt. of TORQUE. This unit has an electric motor with gears. What can it do? Apart from making balanced well shaped beads it makes tight twisty canes,burnishes silver easily,mixes colours,applies stringers. 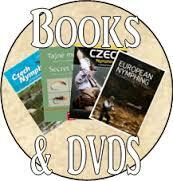 Supplied with a great DVD to show many more applications. Add to your collection of handy Powder Vibe Tubes with the addition of this extra set of six tubes. Saves on emptying out powder to reload another colour. Just instantly attach to the magnetic nose holder of the Powder Vibe in seconds! ..and Voila!.. a new design and a new colour. 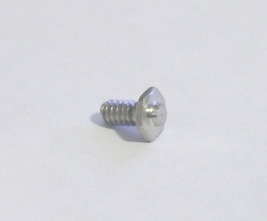 15cm x 8.75cm To use these, you will need a magnetic working surface, ie a sheet of steel (not stainless steel, it's not magnetic) from hardware store and mount it to your working surface with screws. This has a 65 lb strength magnet. 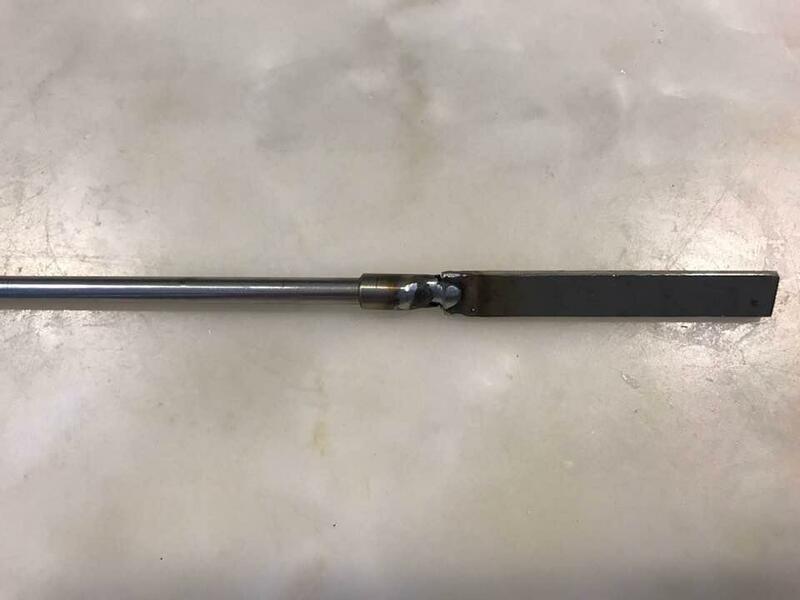 Barrel Lengths: 8.75cm (3.5") each. 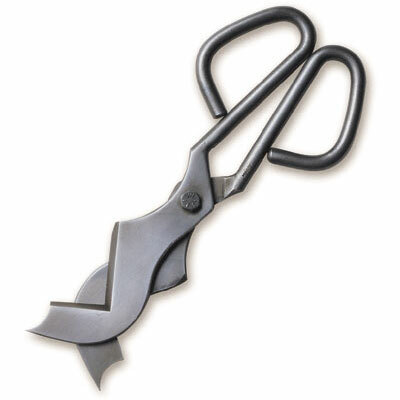 Total Height: 15cm (6") The graphite plate is also removable. 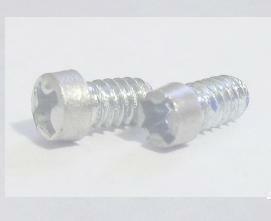 It also has a pin like structure to neaten bead ends mounted on the plate. Dimensions are 43mm tall and the interior diameter is 5/16". 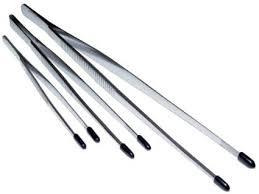 You can put rods up to 7.5mm in each or seven to a dozen stringers or more in each tube depending on the size. Included is the Magnetic Base Plate. If your work surface is already magnetic and you can just stick them on wherever. 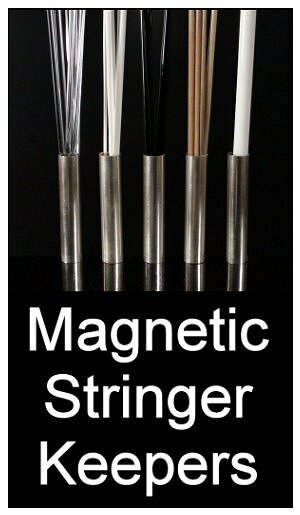 The base of each Stringer Keeper has a super strong Neodymium magnet that is strong enough to hold more than just stringers, additionally, these handy tubes can hold small tools to stay organised. 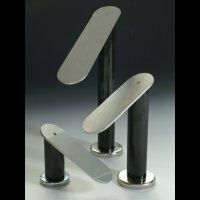 The Magnetic Pedestal consists of two components. 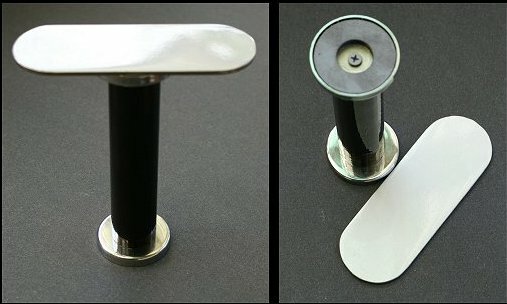 The magnetic stand and a base plate. The two units sit together on you work surface. The pedistal is also magnetic at it's base so will sit firmly on a magnetic surface (not stainless steel). 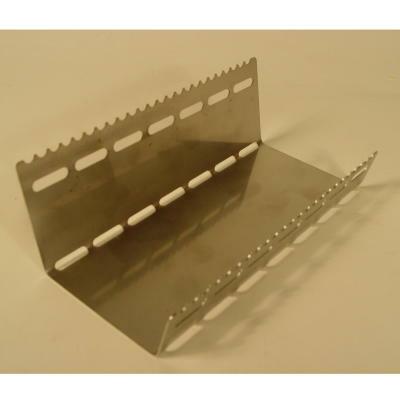 This tool is used to provide a surface directly at torch height and is a handy shelf upon which tools can be placed and used to work at the torch. 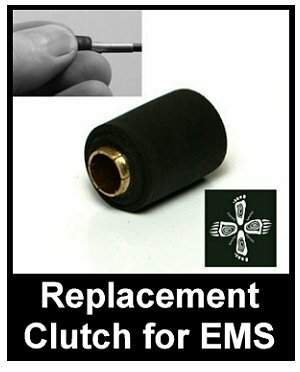 These are the Replacement Brass Sleeves for all EMS models. These sleeves are handy to have for back-up as an extra set,especially when using a particular size regularly. EASY! Simply pull off old one and slide new one on. The clutch is a pressure activated speed control for the Electric Mandrel Spinner. It should last a very long time. They don't usually wear out, but it is rubber and could burn if it gets extrememly hot. 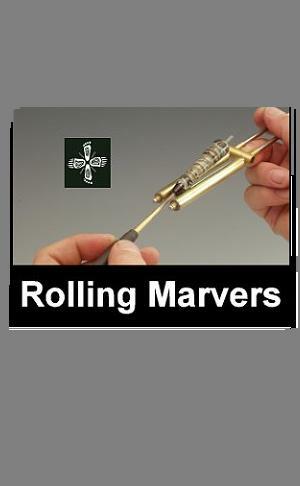 This is very rare as you are using your fingertips to control the speed by resisting the rotation of the Spinner axle. Your skin will burn at a much lower temperature than the rubber, so it takes a serious lapse in attention in order to ruin a clutch. If the clutch starts to get warm, you simply slide the mandrel out a little. This positions the glass and flame further from the clutch making you more comfortable. In stock..These lenses protect your eyes from the sodium flare and UV whilst working with soft glass,at high temperatures. These are fashionable Downtown Designer frames, in charcoal colour. This durable, lightweight design comes with spring hinges. This is best designer frame on the market! The newly released Wide Impress Beadliner is an important addition for the creative bead artist because it provides a greater CHOICE for making WIDER DESIGN PIECES. The NEW WIDE IMPRESS Beadliner works just like the original Impress (above) on "normal" size beads, but has the extra advantage of working on MUCH WIDER ITEMS as well, eg silver pendants, huge beads, fused or slumped glass pieces. This new Impress has 2.75 inches between posts, and still has the same screw and cone size as the original Impress. 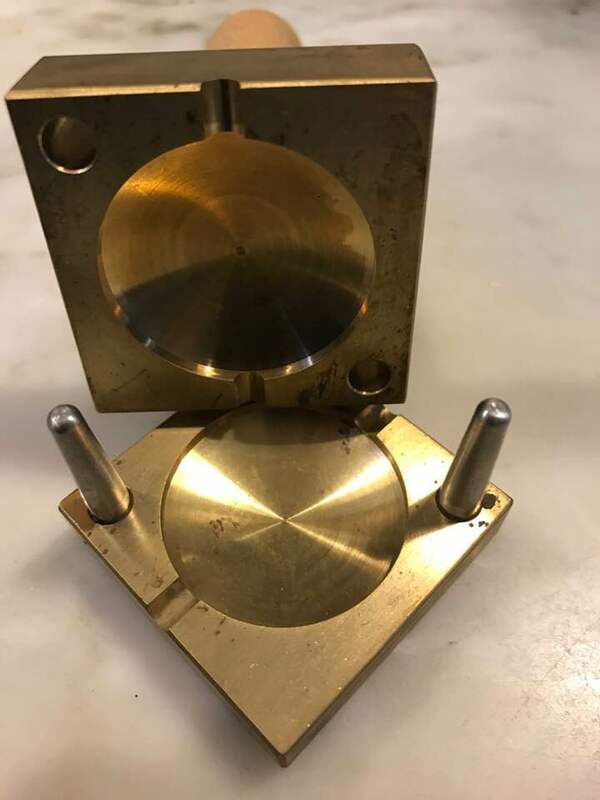 All of the original centering pegs, flaring dies, etc fit in this tool. The WIDE IMPRESS comes already fitted with the PANDORA size Centering Peg. 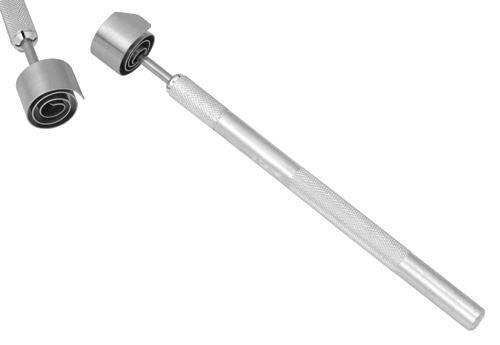 DON'T FORGET TO ADD THIS LABOUR SAVING DEBUR TOOL TO YOUR IMPRESS ORDER... Just one or two gentle spins of this tool removes the bur from the tubing ends instantly, leaving a perfectly chamfered end, which translates to a smooth, shiny, perfectly shaped rivet edge. They make a nice 30 degree chamfer around the inside which then becomes the outside top edge. This makes a much nicer finished professional appearance. Just about 3 seconds per end. It's effortless! and well worth the investment. 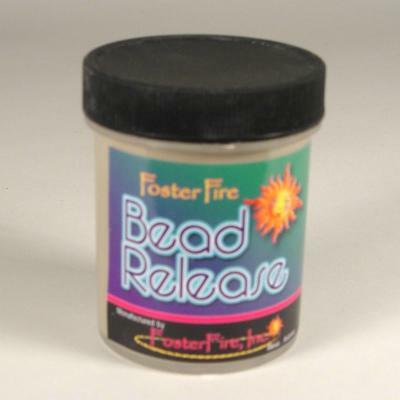 Use Flaring Dies to line narrow holes in beads Flaring Die for 5/32” OD x 1/8” ID or 3.96mm OD/3.2mm ID tubes, for 5/32" mandrel beads They are much the same as centering pegs, but they allow the use of smaller diameter tubing (ie beads made on 3/32", 1/8" & 5/32", regular size mandrels.) 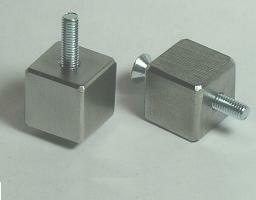 The Flaring Die enables bead caps to be attached to the beads as well as lining the beads with tubing. In Stock.These were the tools used in the Andrea Guarino Classes held here at Beadglass. 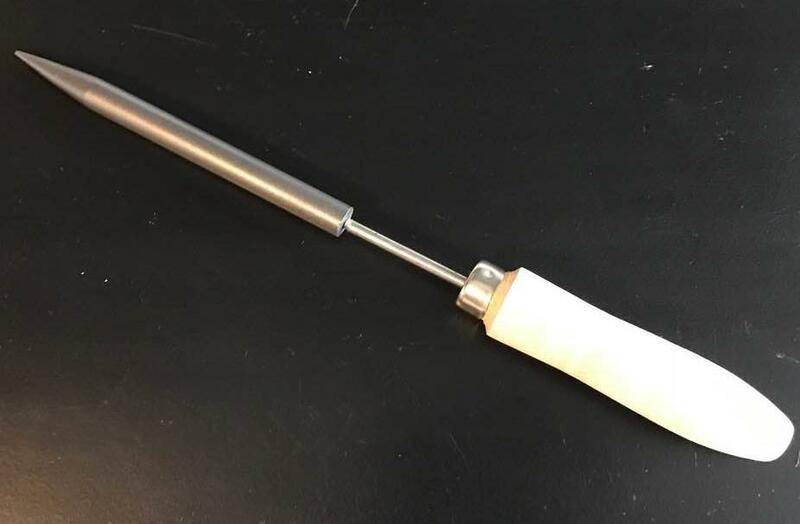 With this tool you can finish your work on the Off Mandrel Tool and load it into the annealer with out a punty mark or mandrel hole to clean up. 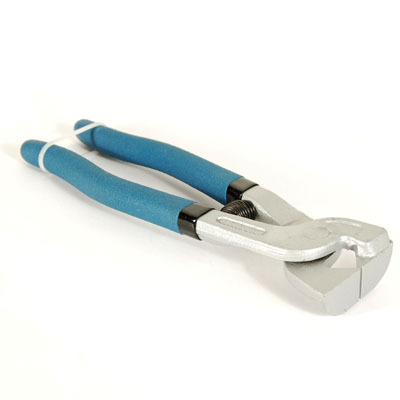 This stainless steel tool has a 250mm by 9.5mm tube to hang on to and a 45mm spring loaded clamp to hold onto your work. On Special..Reduced to 149.50 ...save $50! Limited time only! 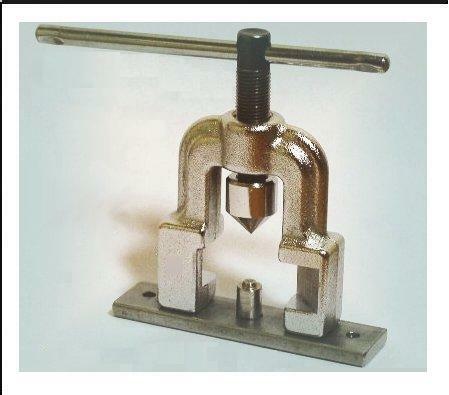 This sturdy, high quality Bead Press is used for capping and lining beads with silver tubing. 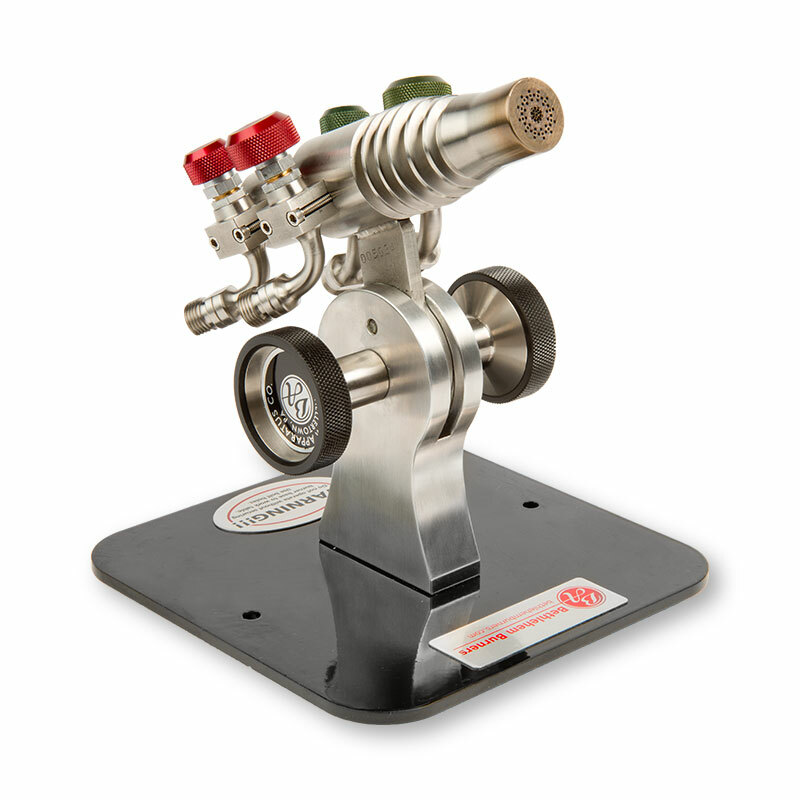 An advantageous addition to the lampworkers bench, it also comes with one die that will flare up to 3/16" tubing. The accessories listed below are only available with purchase of the Jim Moore bead press. 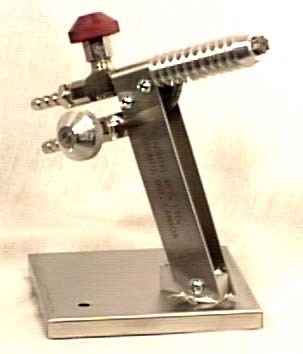 <>Further information For Video to operate see: https://www.youtube.com/watch?v=OCSLOXvU0PY http://toolsforglass.com/catalogs/beadpress_video.html <> For technical information see: http://toolsforglass.com/catalogs/info_beadpress.html http://www.youtube.com/watch?v=OCSLOXvU0PY Jim Moore Bead Presses were used in the Andrea Guarino workshops held at Beadglass which combined Precious Metal Clay and Sterling Silver Tubing to transform beautiful lampwork beads into a work of art. Email us for postage cost to your postcode. In Stock. 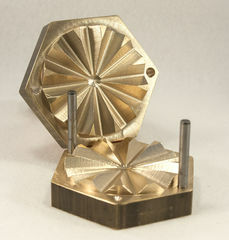 Description: A Bead Press Die for flaring 3/8" to 5/8" tubing. In Stock. 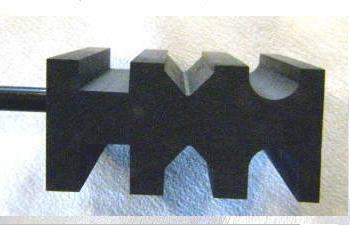 Description: A Medium Bead Press Die for flaring 1/4" to 3/8" tubing. These Dapping Balls are In Stock.Description: Dapping Balls (3/8", 1/2", 3/4") Use these dapping balls to dome your bead caps. You will need to supply your own dapping block. 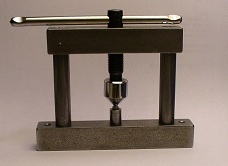 Put a dapping ball in the press and lower it into the chosen socket in the dapping block. This will center the socket under the ball so the bead cap will dome symmetrically. 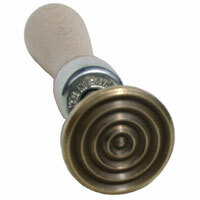 Place a bead cap in the socket and pull on the press, the bead cap is now domed. There are three sizes of dapping balls to choose from depending on the size of the cap and the height of the dome. 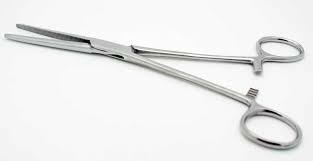 IN STOCK NOW!These shears are first quality, hand made tools specifically designed for acurately cutting and snipping glass.Designed to last a life time of use.Used by the professionals. 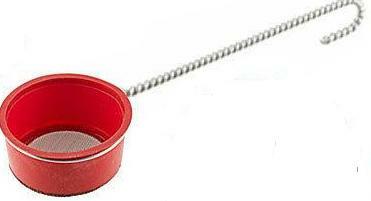 Use Flaring Dies to line narrow holes in beads. 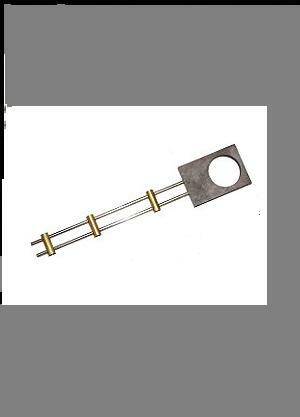 3.2mm OD/ 2.4mm ID or 1/8" OD x 3/32” ID. 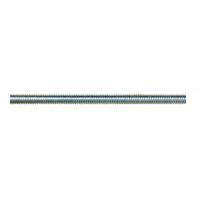 For beads made on 3.2mm or 1/8" mandrels. They are much the same as centering pegs, but they allow the use of smaller diameter tubing (ie beads made on 3/32", 1/8" & 5/32", regular size mandrels.) 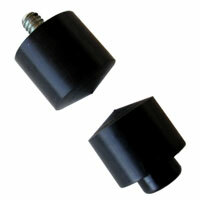 The Flaring Die enables bead caps to be attached to the beads as well as lining the beads with tubing. Use Flaring Dies to line narrow holes in beads. 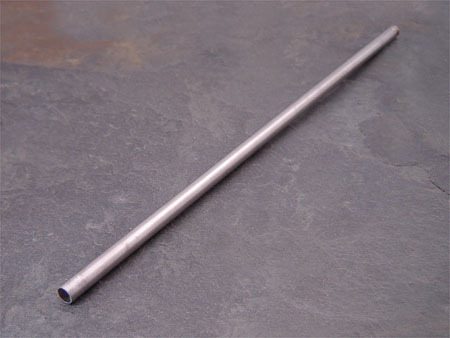 3/32” ID x1/16” ID or 2.4mm OD/1.6mm ID For beads made on 2.4mm or 3/32" mandrels They are much the same as centering pegs, but they allow the use of smaller diameter tubing (ie beads made on 3/32", 1/8" & 5/32", regular size mandrels.) 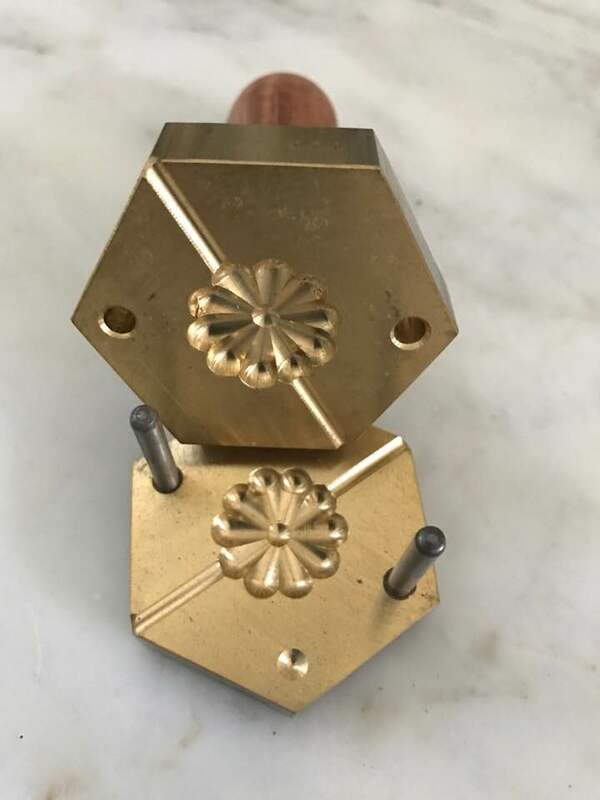 The Flaring Die enables bead caps to be attached to the beads as well as lining the beads with tubing. 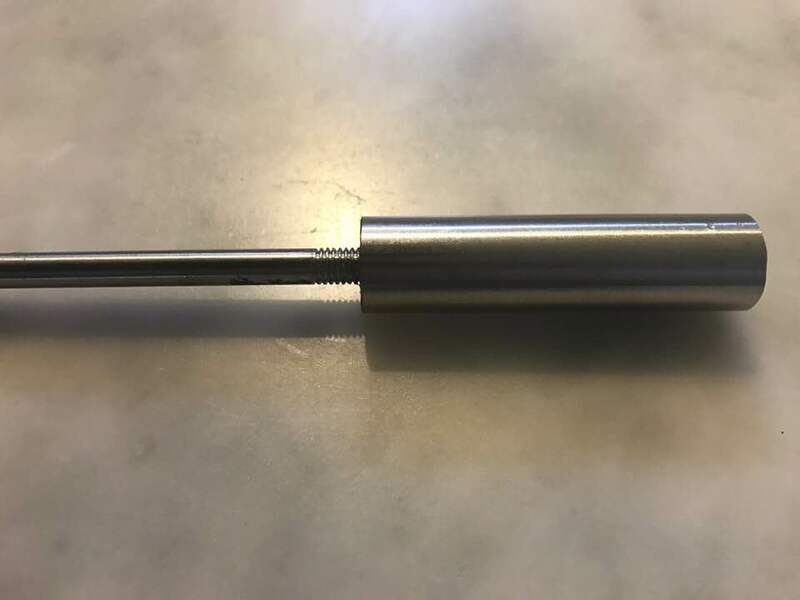 INFORMATION ON THE CENTERING PEGS :Individual sizes to order are all listed below The Impress comes with a centering peg for 1/4 inch OD / .218 inch ID tubing already pre-installed. 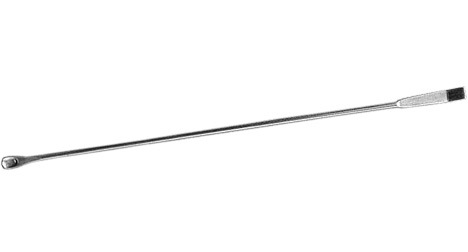 The pegs (ie a small screw with a flat top) are specifically designed in various sizes to fit varying sizes of tubing Internal Diameters( ID ) to line the beads. There are nine sizes from 4.0mm ID to 5.5mm ID. All these varying sizes are listed below to order. To change the pegs simply unscrew the standard 1/4" peg and replace it with a peg that corresponds to your selected ID Tubing size. This can be done using a #2 Philips screwdriver The 1/4 inch peg comes free, so don't order that size unless you want an extra one, or a replacement for a lost one. PLEASE NOTE: The only figure of measurement for choosing centering pegs is the TUBING ID. 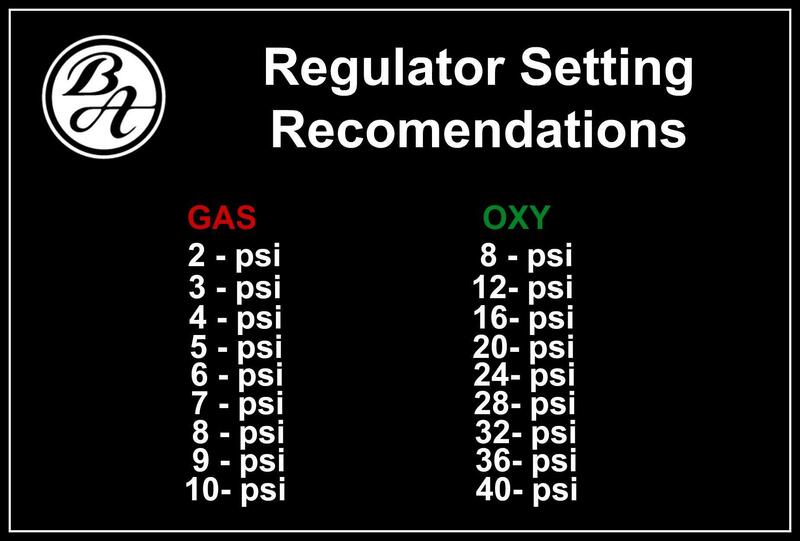 Tubing OD's are also listed in the peg size list, but all that you need to match up is the tubing ID. Typical OD's are listed simply for convenience in identifying common tubing sizes.See individual sizes below. Please note: The only figure of measurement for choosing centering pegs is the TUBING ID. 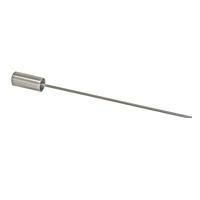 Tubing OD's are also listed in the peg size list, but all that you need to match up is the tubing ID. 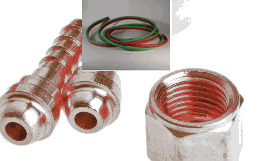 Typical OD's are listed simply for convenience in identifying common tubing sizes. Out of stock. 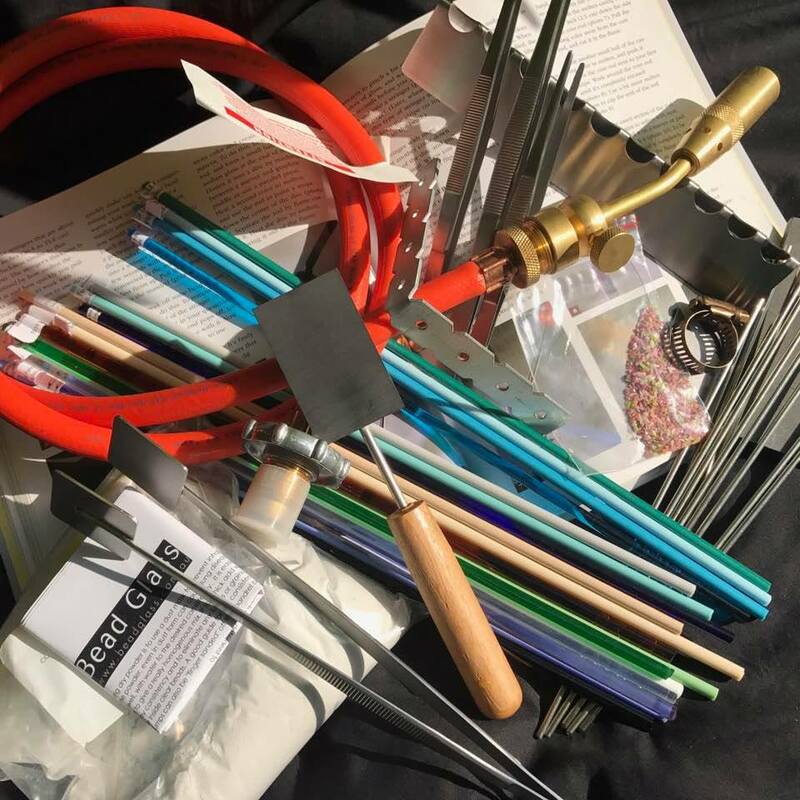 These were the tools used in the recent Andrea Guarino Classes held by Beadglass. 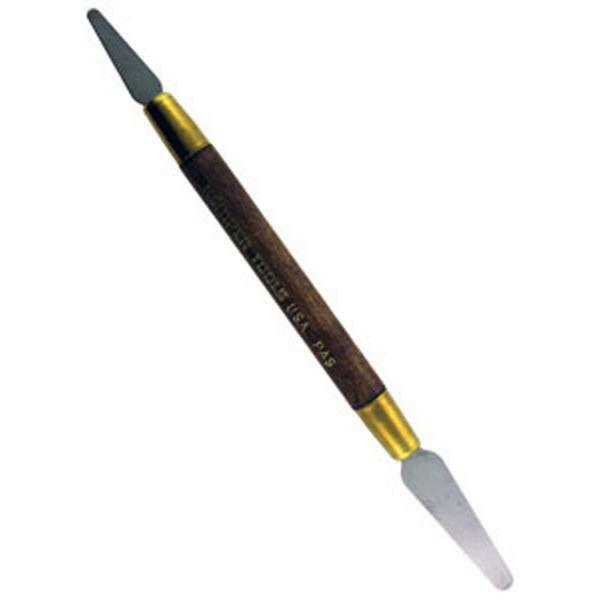 This tool works well with powders and can also be used with silver leaf to create parallel lines of color or silver. 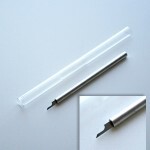 The tool stretches the surface of the glass exposing underlying colors and can also be used to strike glass. 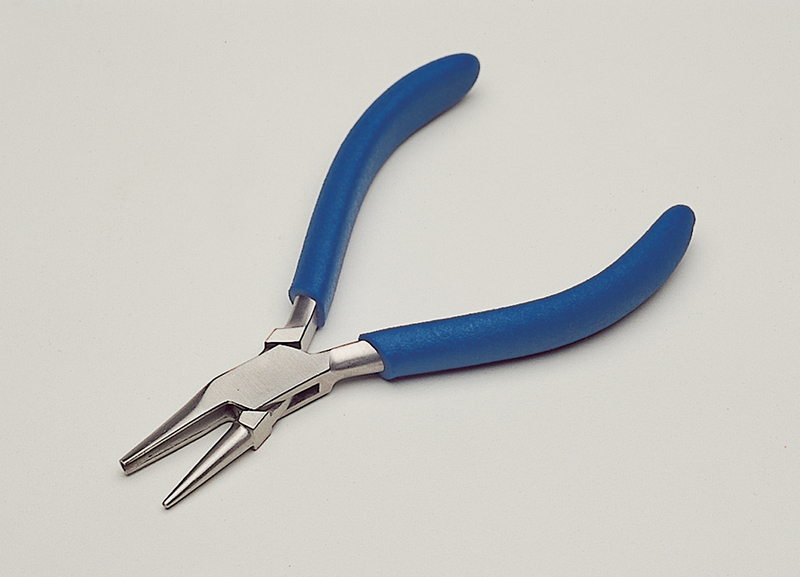 The tool is 30mm wide by 180mm long with a 115mm handle. 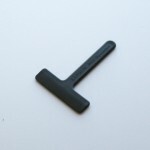 The edges of the rib tool are rounded and polished to protect the edges of the tool from damage. In stock again! These high quality drill bits have a 5mm long, diamond drill which goes right to the very tip of the drill and thereby cleans out every bit of bead release residue leaving nothing behind. 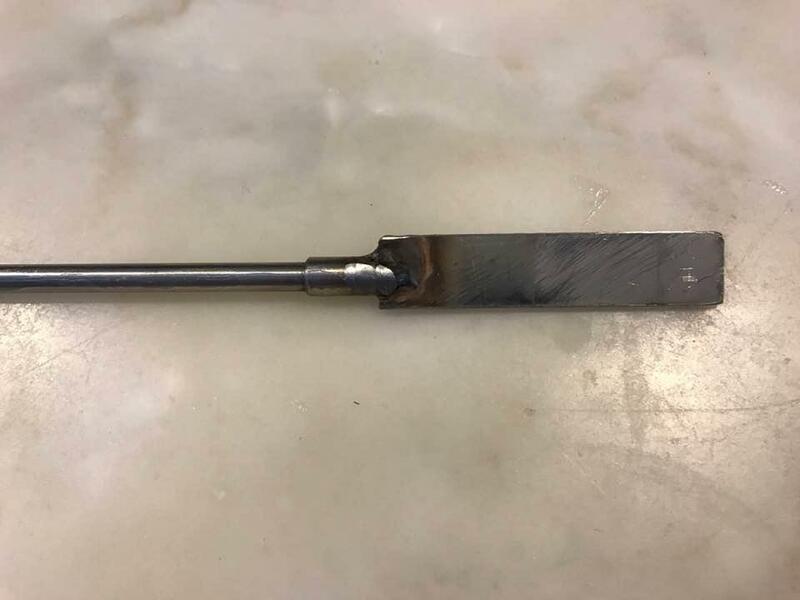 These are extra long 7.5cm drills . Great for transparent beads. 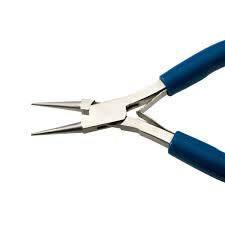 For use with Dremel. New Stock! These high quality drill bits have a 5mm long, diamond drill which goes right to the very tip of the drill and thereby cleans out every bit of bead release residue leaving nothing behind. 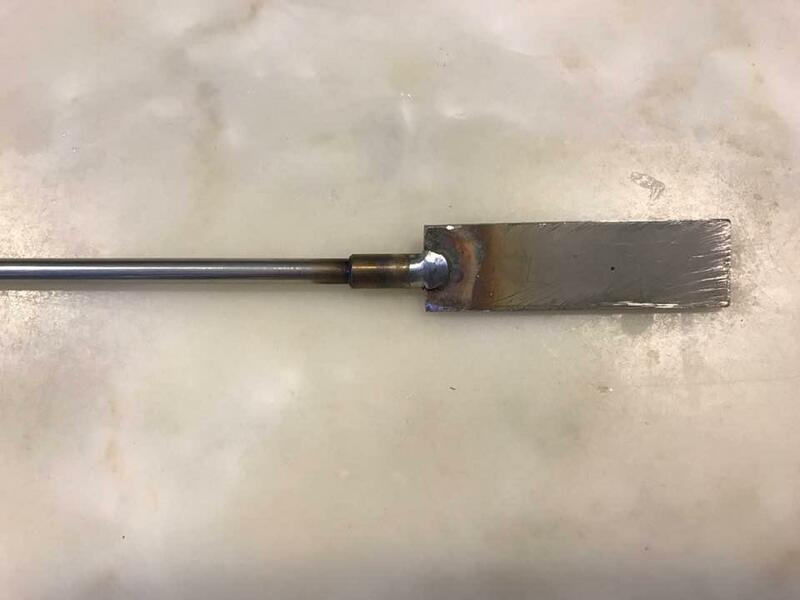 These are extra long 7.5cm drills . 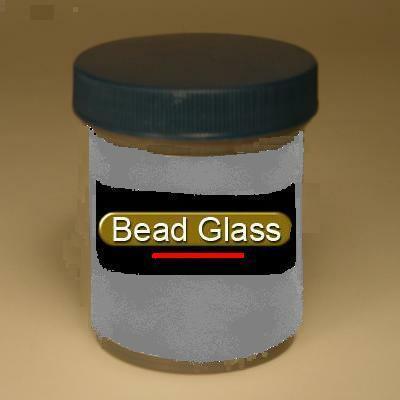 Great for transparent beads. For use with Dremel. New Stock! 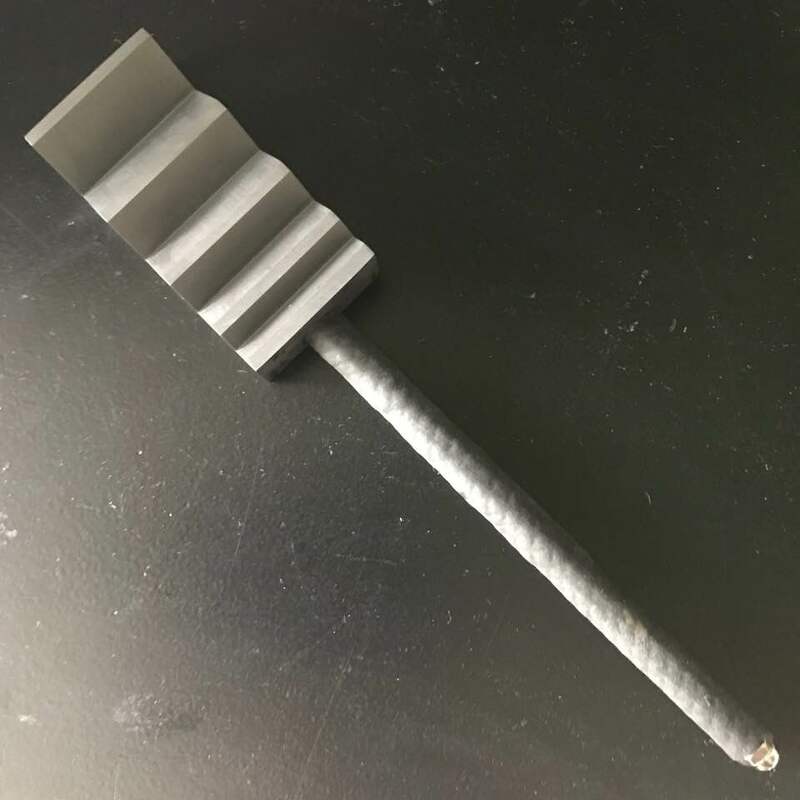 These high quality drill bits have a 5mm long, diamond drill which goes right to the tip of the drill and thereby cleans out every scrap of bead release residue leaving nothing behind.These are extra long 7.5cm drills. Great for transparent beads. For use with Dremel. These high quality drill bits have a 5mm long, diamond drill which goes right to the very tip of the drill and thereby cleans out every bit of bead release residue leaving nothing behind. 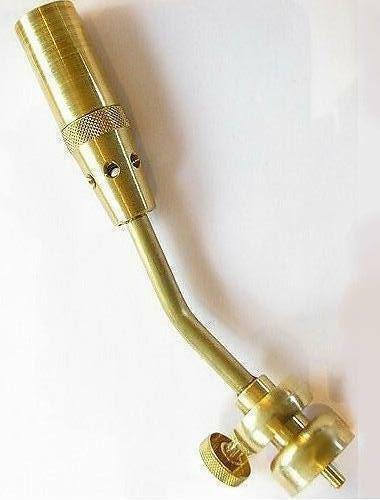 Total length of the drill is 4cm . Great for transparent beads. For use with Dremel. 32 Assorted Colours. Individual 9 gm packs avail. listed here on this page. For full product information and use, see above. In stock.45mm wdth. x 28mm deep ACE 202 READING GLASSES MAGNIFICATION 1.5 in the Downtown Designer frame in charcoal.These lenses protect your eyes from the sodium flare and UV whilst working with soft glass,at high temperatures. With these optically enhanced magnification there is no need to wearing two pairs of glasses. This durable, lightweight design comes with spring hinges. This is best designer frame on the market! In stock! 45mm wdth. x 28mm deep ACE 202 READING GLASSES MAGNIFICATION 2.0 in the Downtown Designer frame in charcoal. 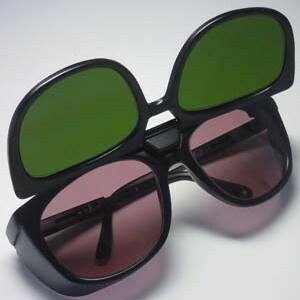 These lenses protect your eyes from the sodium flare and UV whilst working with soft glass,at high temperatures. With these optically enhanced magnification there is no need to wearing two pairs of glasses. This durable, lightweight design comes with spring hinges. This is best designer frame on the market! In stock.... 45mm wdth. x 28mm deep ACE 202 READING GLASSES MAGNIFICATION 2.5 in the Downtown Designer frame in charcoal.These lenses protect your eyes from the sodium flare and UV whilst working with soft glass,at high temperatures. With these optically enhanced magnification there is no need to wearing two pairs of glasses. This durable, lightweight design comes with spring hinges. This is best designer frame on the market! In stock..... 45mm wdth. x 28mm deep ACE 202 READING GLASSES MAGNIFICATION 3.0 in the Downtown Designer frame in charcoal.These lenses protect your eyes from the sodium flare and UV whilst working with soft glass,at high temperatures. With these optically enhanced magnification there is no need to wearing two pairs of glasses. This durable, lightweight design comes with spring hinges. This is best designer frame on the market! 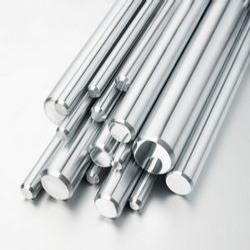 Extra LONG beads can also be lined using these steel blocks which raise the height by 3/4" (20mm), to allow 1½ "(39mm) tube height(ie length of the bead). They are easily installed by removing the two screws from the base plate and replacing them with these and the two longer screws supplied with the kit. All you need is a #2 Philips screwdriver. For even greater height, they may be stacked. You will require 2 inch screws if the Risers are stacked. 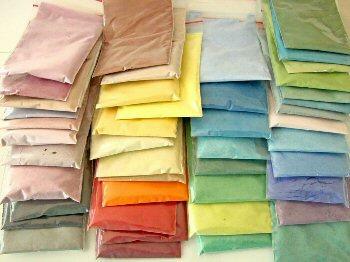 In stock...Etches large & small beads. Using GLOVES,submerge between 1-5 mins.for over-all matt finish. Use the Resist Gel to mask out areas first that are not to be etched.This is a reusable product and will create a frosted etched look which can be left as is, or further enhanced by painting or enameling onto the etched surface.A reusable liquid matting solution that will provide a beautiful matte finish to any transparent, translucent or opaque glass bead including seed beads. Dip n Etch will not harm stringing materials. Out of stock...This Product also supplied in Creme...see listed under 'ETCHALL'under products list. Etches large & small beads. Using GLOVES,submerge between 1-5 mins.for over-all matt finish. Use the Resist Gel to mask out areas first that are not to be etched.This is a reusable product and will create a frosted etched look which can be left as is, or further enhanced by painting or enameling onto the etched surface.A reusable liquid matting solution that will provide a beautiful matte finish to any transparent, translucent or opaque glass bead including seed beads. Dip n Etch will not harm stringing materials. In stock. Use Resist Gel to 'mask' areas on beads before dipping into etching liquid. Once matting of desired areas is completed and wearing GLOVES remove resist under water to protect areas not etched. Out of stock...Etches large & small beads. Using GLOVES,submerge between 1-5 mins.for over-all matt finish. Use the Resist Gel to mask out areas first that are not to be etched.This is a reusable product and will create a frosted etched look which can be left as is, or further enhanced by painting or enameling onto the etched surface.A reusable liquid matting solution that will provide a beautiful matte finish to any transparent, translucent or opaque glass bead including seed beads. Dip n Etch will not harm stringing materials. A white, translucent, high tack paper that has a backing coated with a special pressure sensitive adhesive used with vinyl graphic stencils cut from digital cutters. After cutting the design on etchmask vinyl with the digital cutter, place transfer sheet on top of etchmask. This allows for the cut pieces to stay together. Create your own etching stencils using etchall etchmask vinyl and etchall transfer sheet. Think of a stencil as a sandwich, two pieces of bread and cheese in the middle. The top bread is the transfer sheet, the cheese is the etchmask vinyl and the other bread is the glossy sheet that the etchmask vinyl sticks to. A glossy adhesive vinyl used when creating stencils. It adheres to glass surfaces preventing etchall etching crème or etchall dip ‘n etch to slide underneath. This gives sharp lines and a smooth finish to the design. 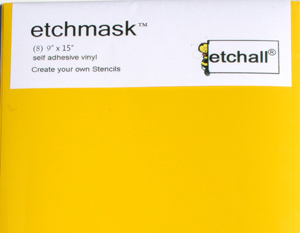 When using etchmask to cut your own stencil designs, please see our instructions for etchmask. Etchmask vinyl is also compatible with all digital craft cutters such as Silhouette SD, Cameo, Cricut, etc. 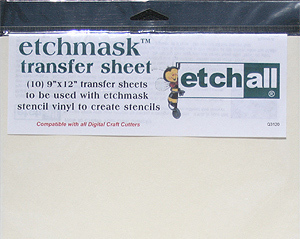 Create your own etching stencils using etchall etchmask and etchall transfer sheet. Think of a stencil as a sandwich, two pieces of bread and cheese in the middle. The top bread is the transfer sheet, the cheese is the etchmask vinyl and the other bread is the glossy sheet that the etchmask vinyl sticks to. The etchall knife combination pack contains: stencil cut/pick knife, etchall swivel knife, 2 swivel knife replacement blades. These are all the great etchall stencil tools combined in a plastic carrying case. 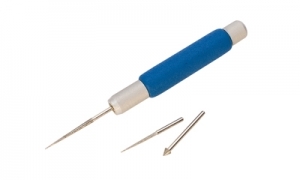 (ON backorder at present)The etchall Detail Pick Tool is a metal instrument with a small thin needle tip used for removing small intricate and hard to reach areas of your stencil; especially helpful for stencil letters and works for larger areas as well. 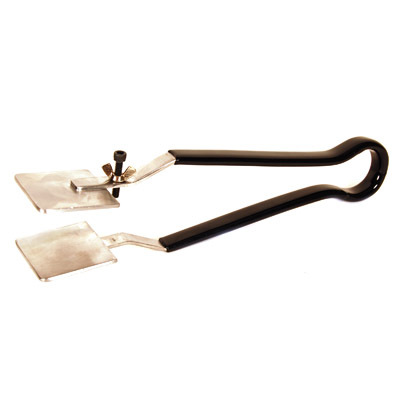 The etchall squeegee is a flexible T-shaped plastic tool used to apply etchall etchmask or pre-cut adhesive stencils to glass or mirror. Once the stencil is in place, the squeegee is perfect for removing air bubbles. 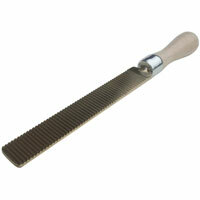 ALSO use the etchall squeegee to apply and smooth etchall etching crème across the surface to be etched. 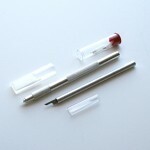 The squeegee is ideal for scraping the etchall etching crème back into the jar for re-use. 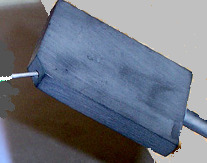 The etchall stencil cut/pick knife is used to remove a portion of the stencil in order to expose the surface to be etched. This process is known as picking or weeding because you selectively remove sections of the stencil. 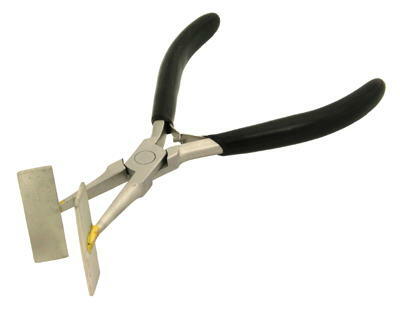 This knife can also be used to cut a stencil or remove small areas left when using the swivel knife. Brand new! Did you know you can use your Silhouette machine, or any die cut machine, to create stylish etched glass... Just cut a shape or phrase in vinyl with your Silhouette or die cut machine and use it as a stencil to etch any glass object with Etchall Etching Creme creating a chic new look. Book contains etchall techniques that make painting on etched glass as easy as ABC. In this book you will be introduced to the newest, unique and elegant etchware techniques. A complete line of glass, mirror and china pieces magically etched just waiting to be painted. 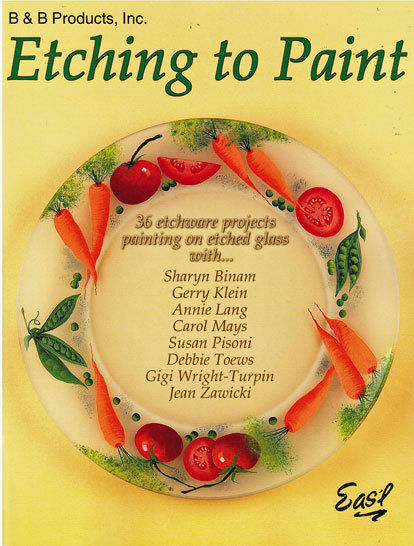 Book contains 36 etchware projects painting on etched glass with 8 different creative authors, 54 pages, softcover. 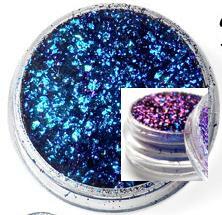 This is the ready made version of the Beadglass Powder. No need to mix, just instant dip. Air dries, holds on to glass well for both solid and hollow beads.Detailed directions and helpful hints included with the bottle. 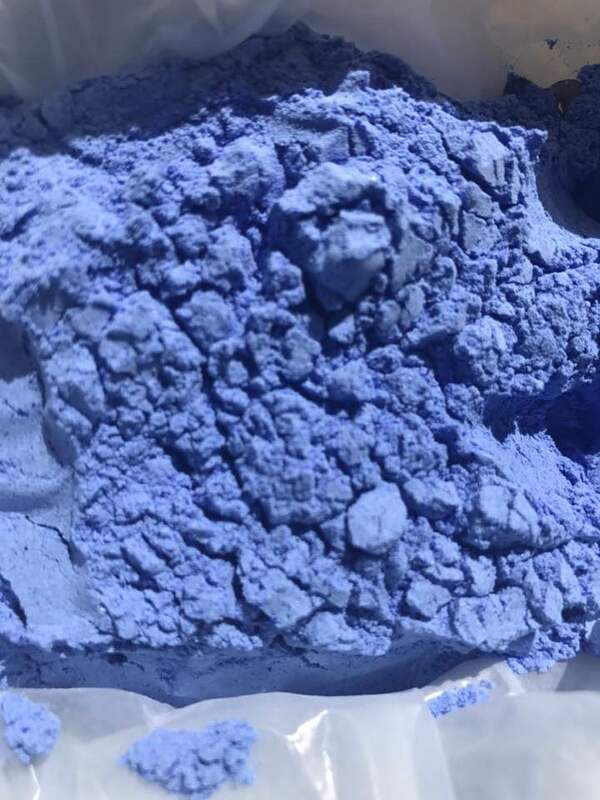 Why and when to use Kiln Wash: The primary purpose of kiln wash is to prevent your glaze from sticking to the kiln shelf, should it come in contact with it during firing. Any glaze will melt directly onto a kiln shelf, thereby sticking to it. Glaze usually only comes in direct contact with the shelf when something goes wrong. Exceptionally intense furnace glass coloured frits.These superb color mixes,are manufactured with COE 96 glass and can be used with all COE 104 glasses.They be used very sparingly because of their intensity and have been methodically tested on Moretti White, Black,Ivories and Transparents to achieve just the right colour blend. 80 x 80 mm/25 sheets Booklet of 25 leaves Interesting fact: 28gm/1oz Au can be beaten out into 187 sq. ft. gold leaf. Use 'Heavy Duty' for boro , sculptural and hollows. Cleans out with ease. Out of stock at present..The ACE 202,protective glasses are the best on the market. These safety glasses filter out UV and soda flare from glass whilst working in the flame or kiln. 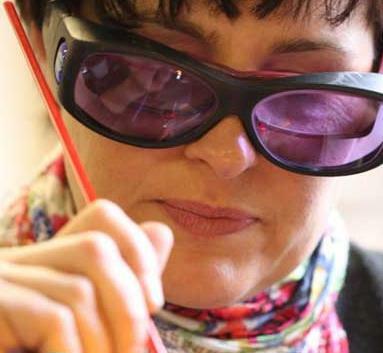 Tried and tested and preferred by the majority of lampworkers.The frame is comfortable to wear and is a smaller frame than the ACE-202 large frame glasses. 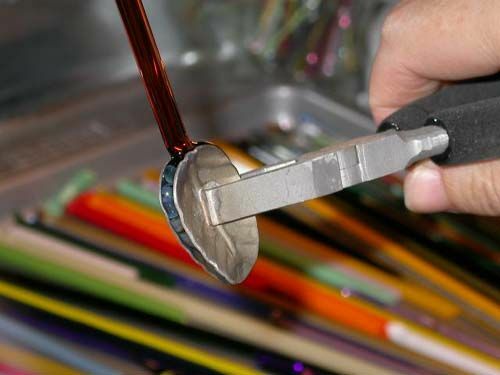 These sifters are used to hold Thompson Enamels while sprinkling onto the molten surface of the glass to produce vibrant new colours,ombré effects or to alter existing colours. Palladium Leaf,book of 25 sheets. 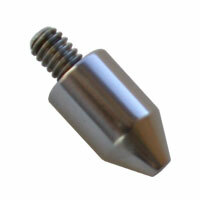 3-5/16" x 3-5/16"
An economical release, perfect for average size beads. 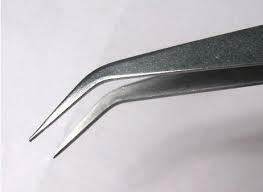 This smooth mixture can also be thinned out if needed for a thinner coating on the mandrel. This formula is also suitable for curved focal mandrels. FRIT and POWDER MINI TUTORIAL: Roll the frit carefully onto the hot bead surface, 2 or 3 times, then gently strike it, working cool!. Using only a 'slightly' reducing flame, by turning the oxy down slightly until a SMALL amount of yellow creeps above the flame candles. Now, 'dance' your bead in and out very lightly in the blue tip of the flame, as though you are gently coating the bead with the flame rotating forward and back and hitting all angles of the bead surface. The surface should result in a beautiful metallic gold finish. This pickle product is the same as used by Lampworker, Larry Scott. No matter what clear glass you use, Pickle Product will remove oxides and dirt from any glass rods. Supplied with directions for the very best results. 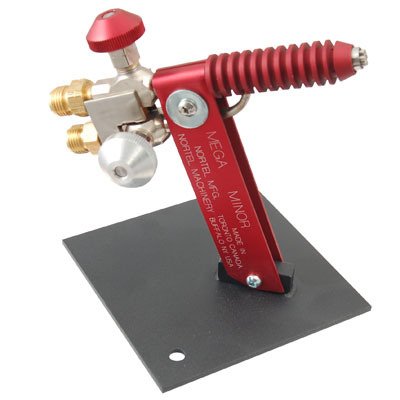 (out of stock)Draw with enamel and have complete control! This Power unit is what is needed for the Enamel Tube Tips(Extra tube tips can be ordered here under Bearfoot Art Products) . 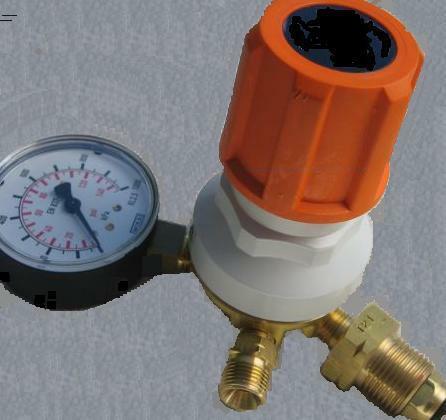 This unit also includes one brass tube tip. Thompson Enamels are also listed for purchase under 'Thompson Enamels' To fill the tip, separate the tube, cover the tip with a finger over the hole, fill with powder and slide the cap into position. 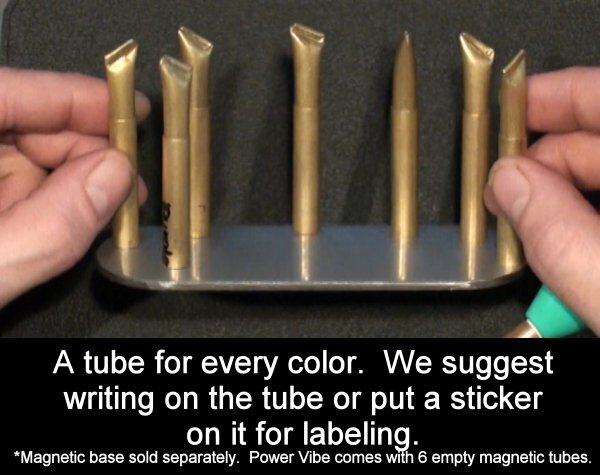 The Vibe Tips easily attach to the Powder Vibe base with a magnet, making changes fast and easy. Simply press the pressure switch on the Powder Vibe to start the flow of powder, and release to stop. 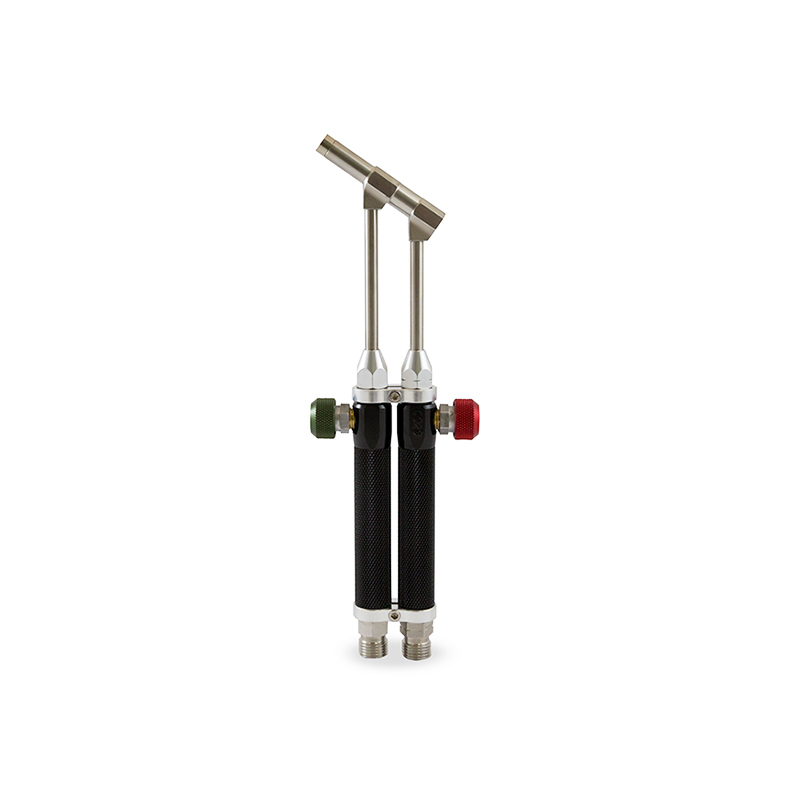 Powder flows out smoothly when vibrated and allows for quick, mess-free application. Sleek design allows for use in either the right or left hand. Runs on two 'AAA' batteries for approximately 14 - 18 hours of continuous use. 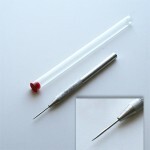 Note: Original tip is designed for enamels and powdered frit and will not work with fine frit or larger particles. 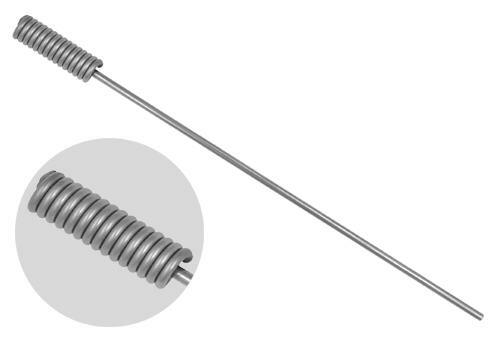 Storage Tip: Store filled powder vibe tip assemblies in a location with low humidity to prevent powder from compacting. 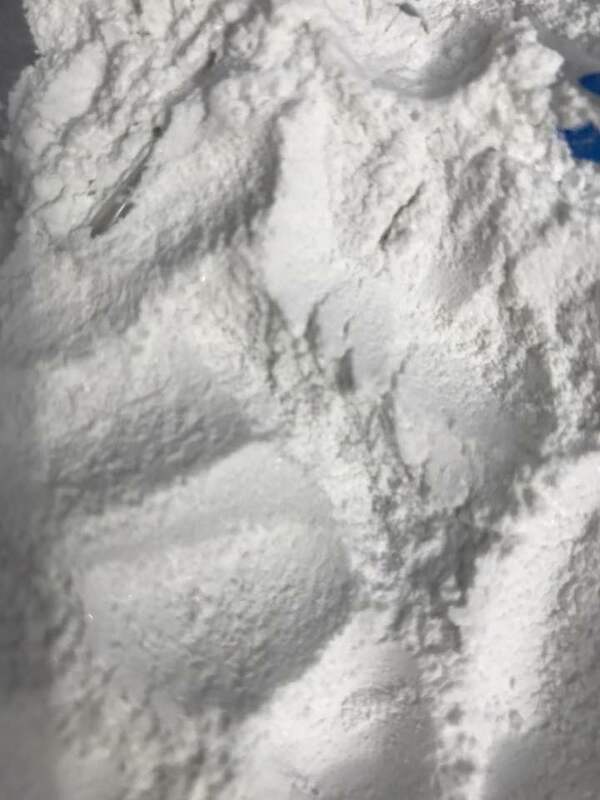 Tips stored in high humidity may not allow smooth flow of powders during application. In Stock. Perfect shape for pendants. 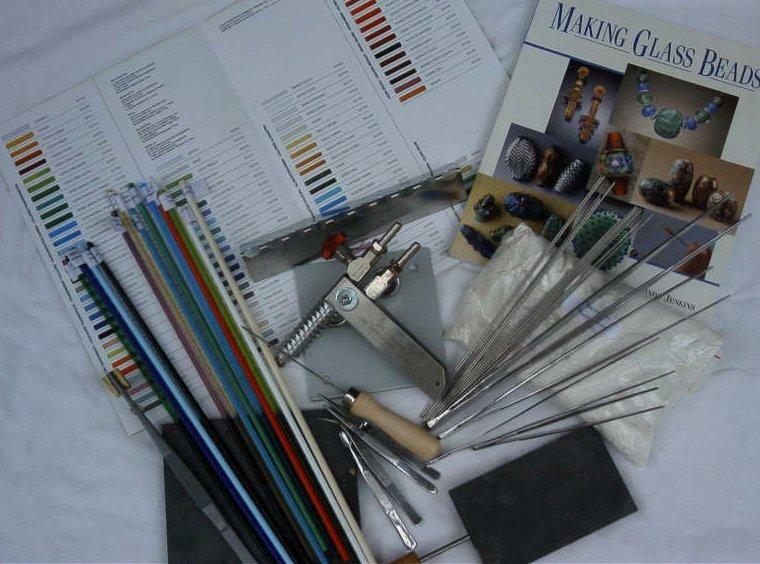 These were the tools used in th Andrea Guarino's Classes held here at Beadglass. 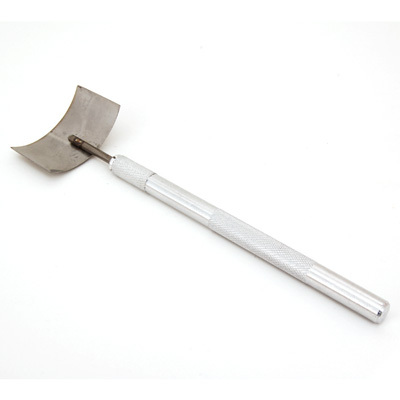 Made by renoun toolmaker Jim Moore, this tool creates a cushion or pillow shape. 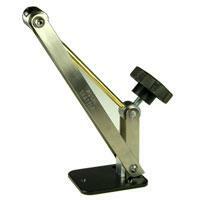 It has a 26.5cm spring steel handle with 3.7cm x 5cm variable size cushion shape press :Please note this size is variable and with a reduced volume of glass smaller 'cushion' shapes can also be formed creating multi uses on the one press. 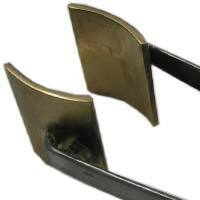 When the brass plates are closed together, the thickness in the widest part is 12mm approx. The Diamond Bead Reamer Set exclusively from EURO TOOL features three reamer points and a 11cm hollow handle in which to store them. 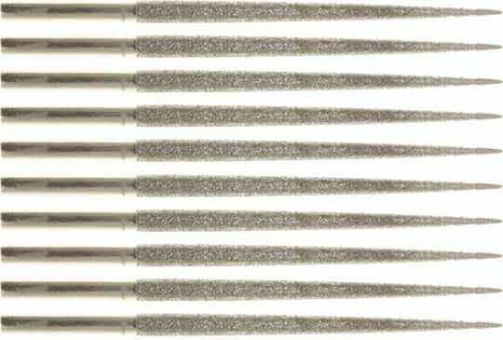 These superior quality bead reamers with diamond tips enables one to clean, and if necessary enlarge holes in glass, ceramic, poly clay, and other materials including stone. 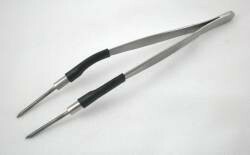 The set includes 2 reamers for small and large beads as well as another with a 45 degree edge reamer so the bead will not cut through bead cord. 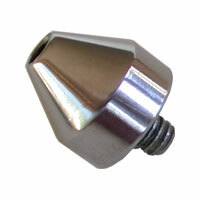 An easy release chuck friction fitted into the aluminum housing releases instantly when the collet is unscrewed. An anodized aluminum handle ensures a comfortable grip while the chuck is manufactured from brass so rust is never a problem. Made in USA. Specifically for lampwork, these are the new style quality fitover glasses, designed for eye protection whilst the ACE lenses ensure harmful soda flare and UV is filtered out when lampworking at the flame. Comfortable, lightweight design made to sit over the top of your own optical frame glasses. Can be used with or without your own glasses. READERS CLIP ON LENS 1.50 STRENGTH Designed to magnify with convenience, by cliping onto your lampwork glasses and also has a flip up hinge to lift up the lenses if not needed. READERS CLIP ON LENS 2.00 STRENGTH Designed to magnify with convenience, by cliping onto your lampwork glasses and also has a flip up hinge to lift up the lenses if not needed. READERS CLIP ON LENS 2.5 STRENGTH Designed to magnify with convenience, by cliping onto your lampwork glasses and also has a flip up hinge to lift up the lenses if not needed. READERS CLIP ON LENS 3.0 STRENGTH Designed to magnify with convenience, by cliping onto your lampwork glasses and also has a flip up hinge to lift up the lenses if not needed. TWO pair for one! 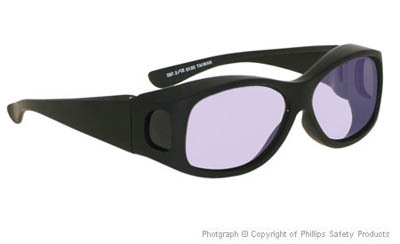 Economical and great for soft and hard (BORO) glass, Includes SB series Sodium Flare UV/IR durable fit over frames along with a shade #3 welder’s shade clip-on flip up. Fits over most existing glasses very nicely. Flip up for soft glass and down for hard glass. Extremely comfortable and super light weight. 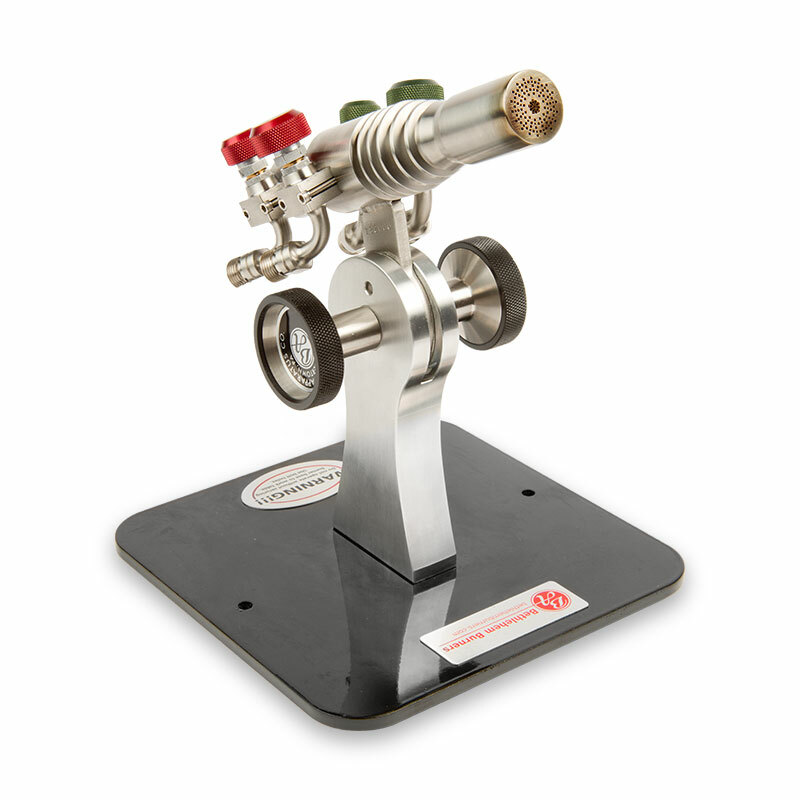 IN stock...The ultimate flame drying mandrel release for all sizes of solid and hollow mandrels. 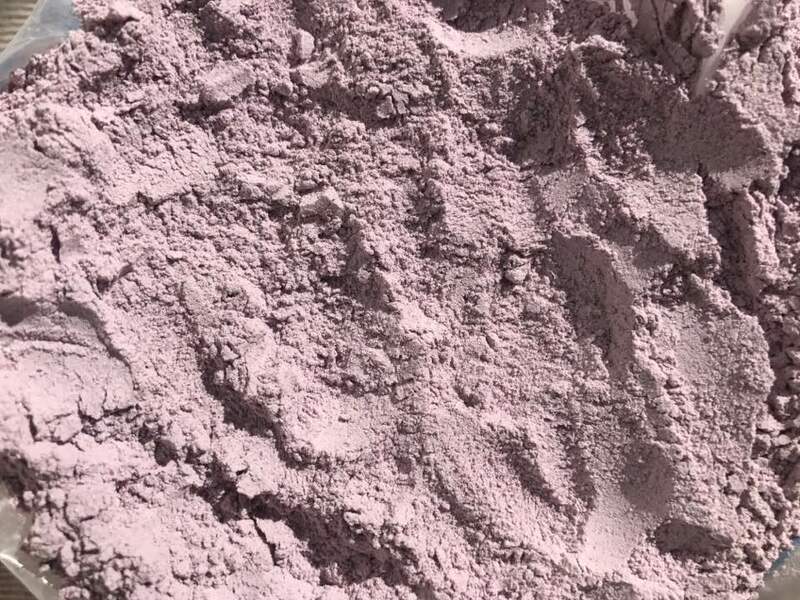 A thin coating can be flame dried completely within seconds. A thicker coating is be placed further out in the flame and dried over a ten to twenty second period. Strong while working the glass, yet easy to release when cool. Dip-n-Go Sludge™ ULTRA replaces Dip-n-Go Sludge™ and is the next steep in the evolution of mandrel releases. 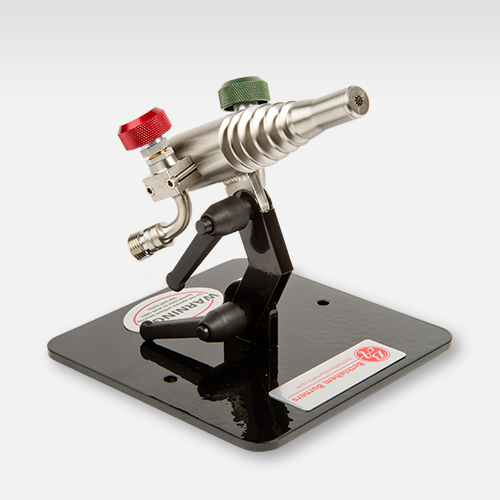 IN stock.....The ultimate flame drying mandrel release for all sizes of solid and hollow mandrels. A thin coating can be flame dried completely within seconds. A thicker coating is be placed further out in the flame and dried over a ten to twenty second period. Strong while working the glass, yet easy to release when cool. Dip-n-Go Sludge™ ULTRA replaces Dip-n-Go Sludge™ and is the next steep in the evolution of mandrel releases. FURTHER DETAILS: See these listed under 'Equipment' Page. 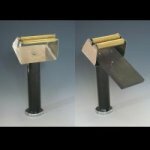 The Mandrel Rest is the ultimate annealer accessory for your kiln. (Out of stock)These pieces are custom made from Gaffer Chalcedony COE 96 glass. They have been hand blown and broken into pieces. These shards are produced from very thin pieces of glass and vary in thickness. 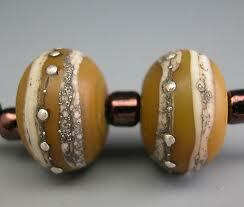 They can be applied to the surface of a bead at the torch in the lampwork process. The PolyCarb Clip On ,with Soda Flare and UV protection. These safety glasses filter out UV and bright soda flare from hot soft glass whilst working in the flame or kiln. These are light comfortable,and are easy to clip onto your own optical glasses.Measurements of 'each'individual glass lens is 40mm depth x 50mm wide.These can be adjusted slightly to fit onto your optical glasses. The list below is an attempt to carry all the different supplies of Mandrels available today on the market for Lampworkers. 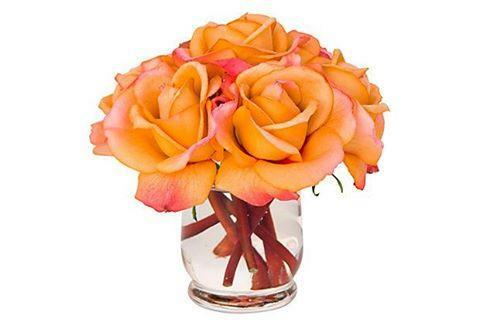 Your requests are always listen to and we will accept special orders. 1.6mm There are 72 Mandrels in 250 gm. 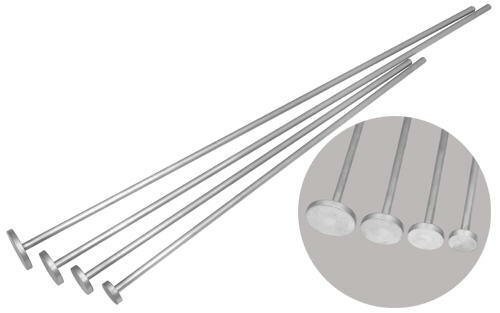 is only Size:1.6mm This is the standard size diameter.High quality stainless steel, low heat transfer,all mandrels are 25cm long and polished ends for easy removal of beads. 3.2mm There are 16 Mandrels in 250gm. Our price is only 69 cents each! 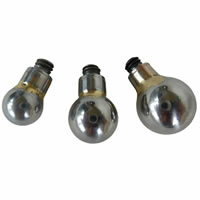 Size:3.2mm High quality stainless steel, low heat transfer, ends polished for east removal of beads. All mandrels are 25cm long. 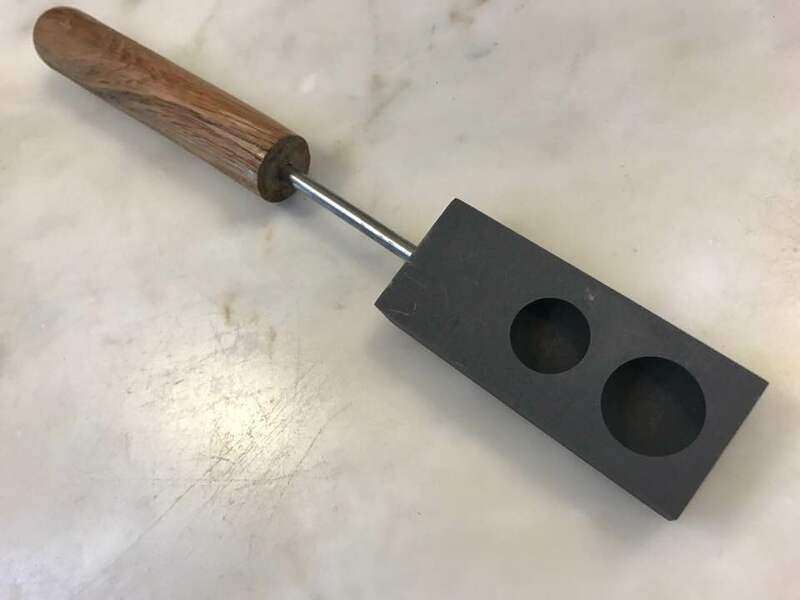 Presently out of stock..Round 'Face' Cabochon Mandrel 31.5mm or 1.25" Diameter....... TUTORIAL: Dip the mandrel inside the bead release container and spin or tap inside the container to remove excess release with a smooth layered application left on the mandrel. A kitchen spoonful of release can also be used for this process, then use the back of the spoon to spread the release evenly on the cab. 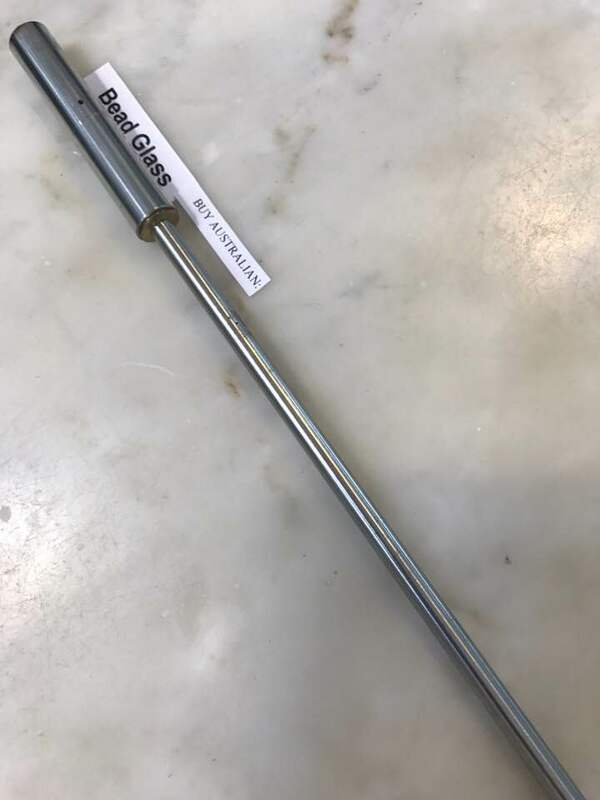 It is best to air dry these mandrels rather than flame drying to prevent the release from cracking, then slowly heat in the flame as well as the front where the glass is to be applied, making certain you have the mandrel hot enough for the glass to stick. If you don't have the glass adhered to the mandrel it may come off if you turn it upside down. Keep adding glass, while pushing. Be careful not to pull your glass away from the cabochon. 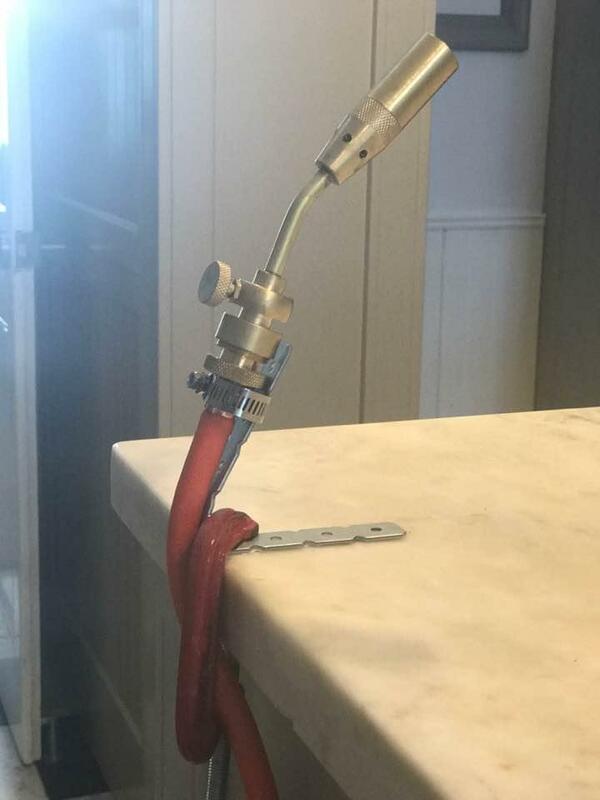 If you want to remove the rod, then use the heat to cut the glass, never pull. 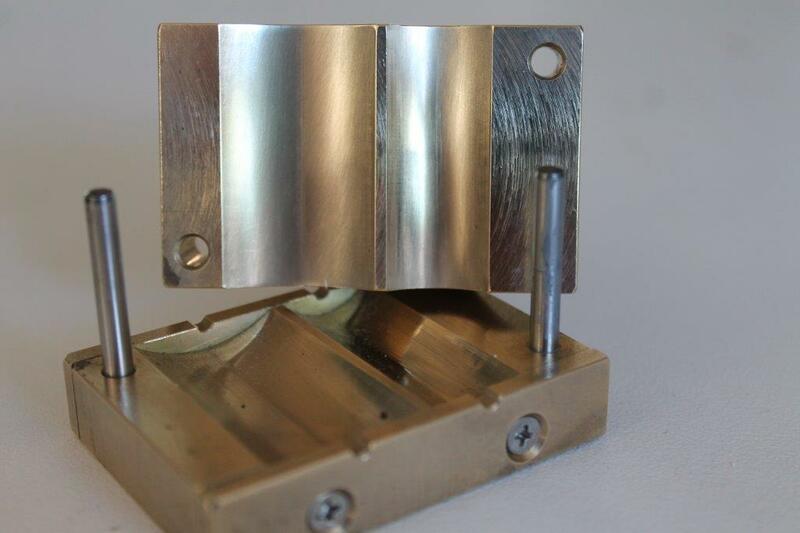 Anneal in the usual way. The cab can be removed by twisting and lifting. 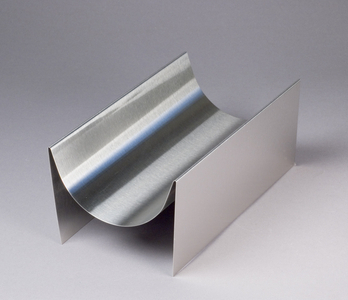 Ideal curved tray makes it easier to apply and roll in frit or enamel to the hot bead surface. These are the new style quality fitover glasses, designed with a slightly darker lens ensures eye protection, by filtering out harmful soda flare and UV, when working at the flame. These glass are specifically for 104 soft glass, eg Effetre or clear borosilicate glass,glass blowing, and kiln working. Comfortable, lightweight design can also be used over the top of your own optical frame glasses. Can be used with or without your own glasses. 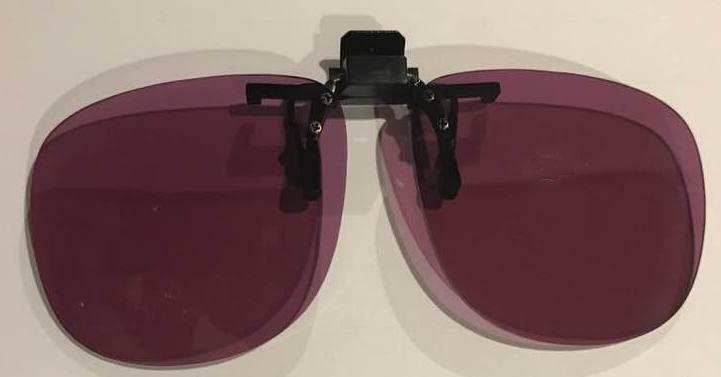 (out of stock) These Polycarb Clip on Glasses, protection for additional brightness reduction against Sodium Flare, UV, and IR protection,typically used by the borosilicate glass lampworker, whilst working at the flame or kiln. 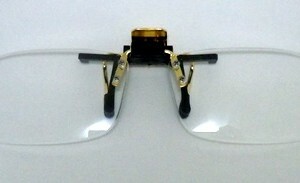 These are light and comfortable and clip onto your own optical glasses. 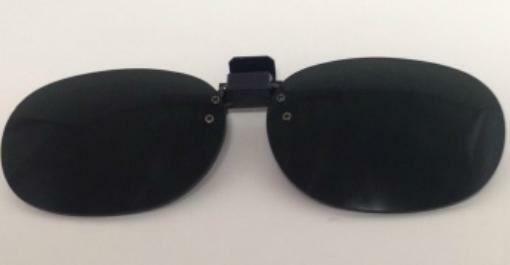 These can be adjusted slightly to fit onto your optical glasses. Colour shifts from Royal Blue to Purple to Magentas Description on 'How to Use' is at the top of this page. 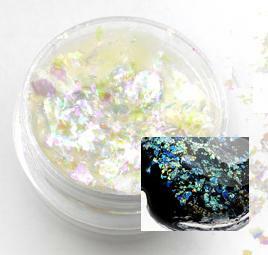 See this brand new product listed in the online shop under 'Lumiere Lusters" by JetAge Studio are specialty color shifting, heat resistant metal oxide powders and flakes and powders that work glittery magic in lampworked glass, and a multitude of other mediums. 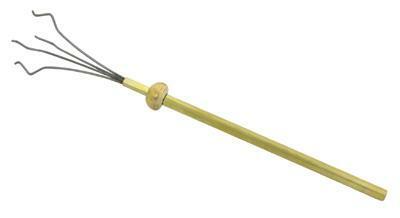 They are rated to resist heat up to about 1400F, and don't have a specific coefficent. 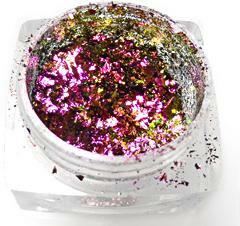 Similar to Dichroic Extract powder, they shift color and throw off a lot of shine. 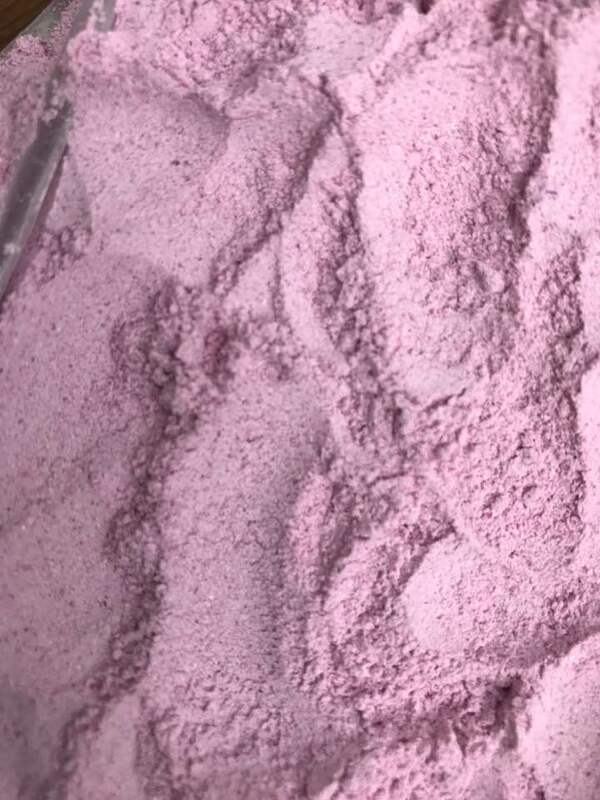 The larger particle sizes create a lot of sparkle that you cant get from micas, and give quite a different effect from powdered extract. 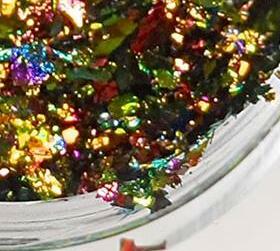 They're also a great cost effective alternative to dichroic coatings and are more heat tolerant than regular powdered micas. Colour shifts from Red to Tangarine to Brilliant Gold Description on 'How to Use' is at the top of this page. 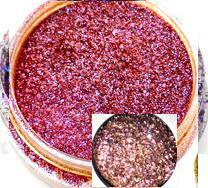 Colour shifts from Violet to Magenta to Tangarine Gold Description on 'How to Use' is at the top of this page. Colour shifts from Green to Teal to Aqua to Deep Blue..Description on 'How to Use' is at the top of this page. .Extra large transparent flakes,colour shifts in greens and teals and look best over a dark base eg Black.Description on 'How to Use' is at the top of this page. Colour shifts from Rainbow Teals to Magenta Blues.. Description on 'How to Use' is at the top of this page. 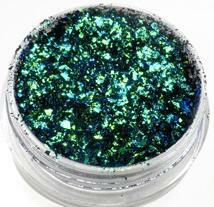 Colour shifts from Shifts to Oil Slick Rainbow, predominantly bright Spring Green.. Description on 'How to Use' is at the top of this page. Colour shifts Blue-Pink Fuschia and Copper. Description on 'How to Use' is at the top of this page. Colour shifts Blue-Pink -Copper Gold. Description on 'How to Use' is at the top of this page. Colour shifts Deep Pink to Copper Pink to Orange Gold. Description on 'How to Use' is at the top of this page. Colour shifts Pink Gold to Tangerine Green Gold. 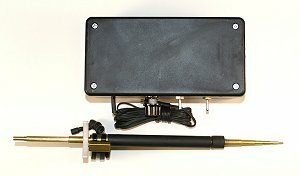 Description on 'How to Use' is at the top of this page. 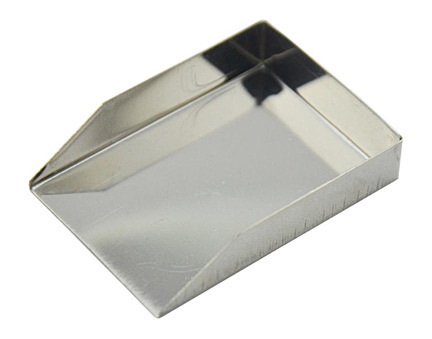 This three sided container is made of stainless steel, and is perfect for working the lusters. Simply put the amount you need in there for working into glass. 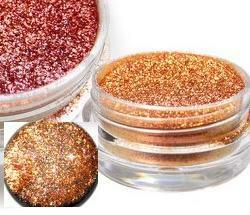 It is heat safe and will help to keep the flakes and powders in check while working with them. 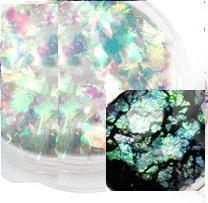 When done, angle the container's open end downward at the corner and scrape the rest of the luster back into the jar. Handy! 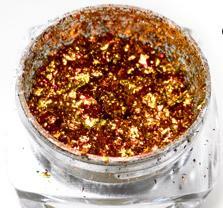 Perfect for lifting out small amounts of luster onto a work surface. Scrape leftovers back into container with the flat ended spatula. 2.3mm There are 24 Extra Long Mandrels in 250 gm. Our price is only 79 cents each! 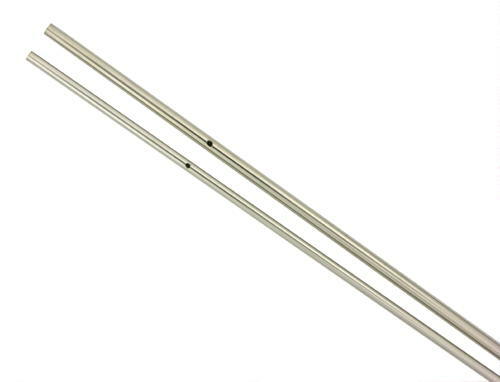 For those of us who prefer longer mandrels 300mm x 2.3mm PACK of 12 Size:2.3mm Made of high quality stainless steel, low heat transfer, and ends polished for easy removal of beads. All mandrels are 300mm long. 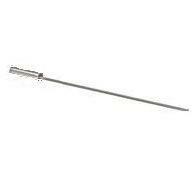 3.2mm There are 14 Extra Long Mandrels in 250gm. Our price is only $1.20 each! 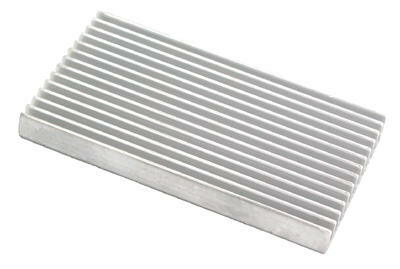 For those of us who prefer longer mandrels 300mm x 3.2mm PACK of 12 Size: 3.2mm Made of high quality stainless steel, low heat transfer, and ends polished for easy removal of beads. All mandrels are 300mm long. Colour shifts from Teal Green to Fuschia to Blue Violet..Description on 'How to Use' is at the top of this page. 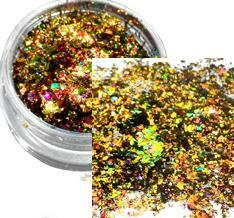 Multi Colour Rainbow with lots of Gold Shine..Description on 'How to Use' is at the top of this page. 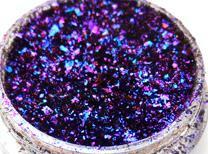 Colour shifts Ultra Marine to Purple to Fuchsia..Description on 'How to Use' is at the top of this page. Colour shifts from Emerald Green to Teal to Pink with Silver Holographics..Description on 'How to Use' is at the top of this page. 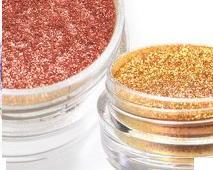 Colour shifts from Fuchsia to Copper to Orange to Holographic Gold..Description on 'How to Use' is at the top of this page. 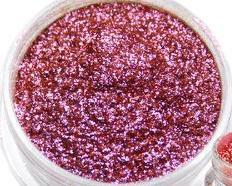 Colour Fuchsia with Pink Holographics ...Description on 'How to Use' is at the top of this page. Colour shifts from Bright Red to Deep Orange with Holographic Deep Gold...Description on 'How to Use' is at the top of this page. Colour shifts from Fuchsia Pink to Yellow Green to Holographic Silver Green ...Description on 'How to Use' is at the top of this page. 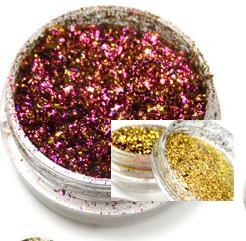 Out of stock...Rainbow Colours with Holographic Golds ...Description on 'How to Use' is at the top of this page. 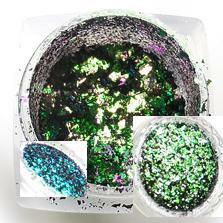 ...Large Transparent Flakes which reflect bright intense green, blue to purple tones. 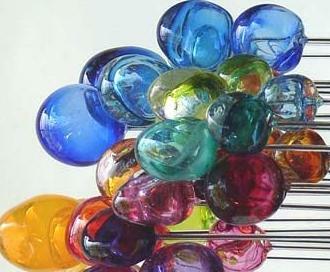 On non-lampwork mediums and light coloured bases they will transmit pinks and yellows... 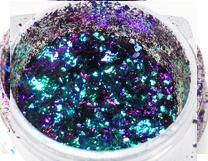 Please note: this flake only reflects color over dark bases....Description on 'How to Use' is at the top of this page. 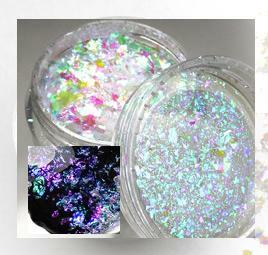 Large Transparent Flakes which reflect intense bright purples and green to blues. 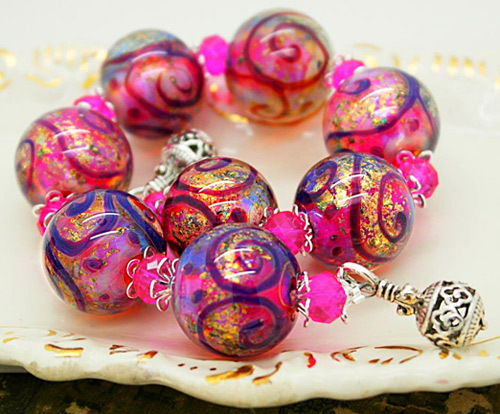 On non-lampwork mediums and light coloured bases they will transmit pink tones . .. 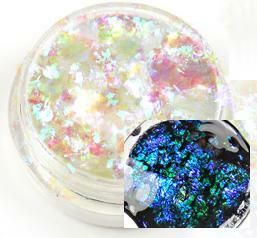 Please note: this flake only reflects color over dark bases....Description on 'How to Use' is at the top of this page. 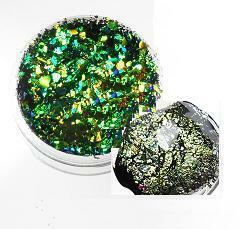 Large Transparent Flakes which reflect shimmery silvery greens and blues.On non-lampwork mediums and light coloured bases they will transmit greenish-yellow tones . .. 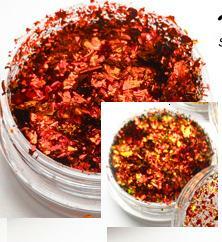 Please note: this flake only reflects color over dark bases....Description on 'How to Use' is at the top of this page. 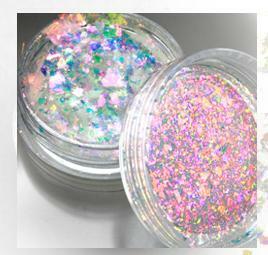 Out of stock at present...Large Transparent Flakes which reflect intense bright Pinks and Rainbow tones. 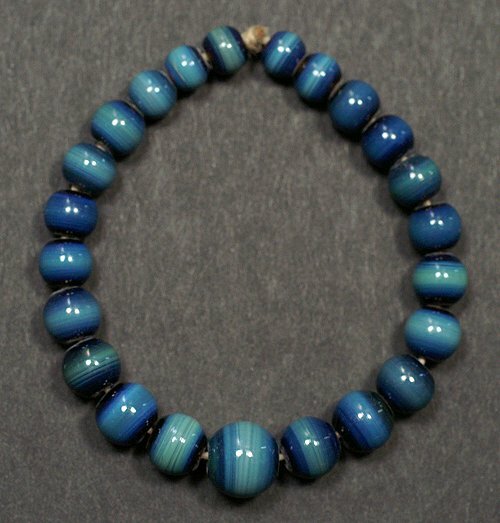 On non-lampwork mediums and light coloured bases they will transmit teal blues . .. 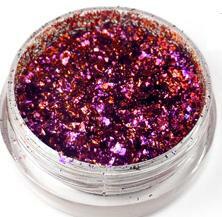 Please note: this flake only reflects color over dark bases....Description on 'How to Use' is at the top of this page. Made by Terry Ainsley ...Some scuff marks ... 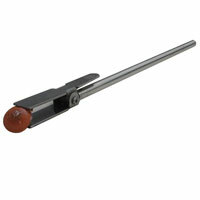 The small ribbon mandrel is 8mm x 200mm x 2mm thick and handle length 200mm. Beads made on this mandrel, will have a thin rectangle hole running through them so that a flat ribbon can be threaded through the space. 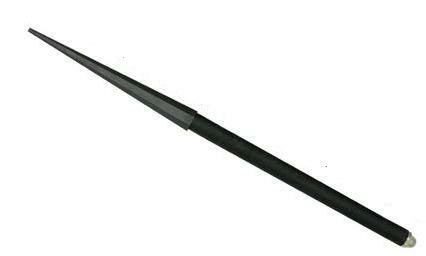 Out of stock...Made by Terry Ainsley ...Some scuff marks ...The medium ribbon mandrel is 12mm x 200mm x 2mm thick and handle length 200mm. Beads made on this mandrel, will have a thin rectangle hole running through them so that a flat ribbon can be threaded through the space. 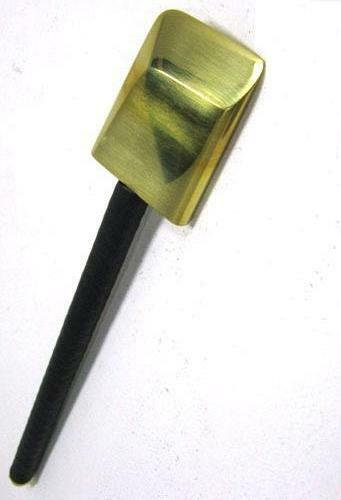 Made by Terry Ainsley ...Some scuff marks ...The medium ribbon mandrel is 16mm x 200mm x 2mm thick and handle length 200mm. Beads made on this mandrel, will have a thin rectangle hole running through them so that a flat ribbon can be threaded through the space. Hollow Vessel Shaper welded onto hollow 280 mm stainless tube handle, allows the glass to be expanded by blowing through the tube... . 3mm tip flares out to 6mm head x curves out to a 15mm diameter across the base of the completed vessel. 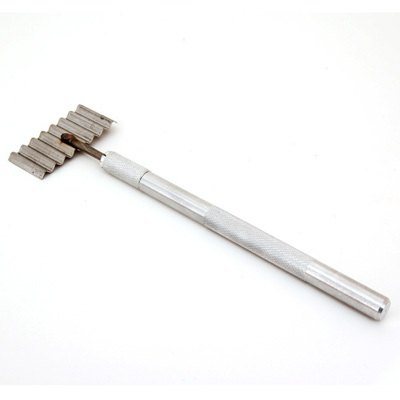 This Deluxe 20cm width x 6.5cm ht x13cm long, KILN Mandrel Rest is the ultimate annealer accessory. 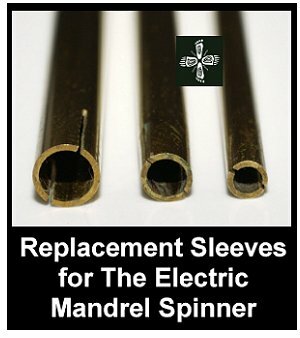 Bigger, better, and much tougher than the original mandrel rest while giving you up to twice as much mandrel capacity. Properly placing your beads in the annealer is a great way to avoid denting or the sticking of your beads. With a stable base and 2¾" height, the rack safely suspends all your beads, preventing them from touching each other or the annealer and becoming damaged. Use the front tier to rest your mandrel on, or choose the back tier, with its larger holes, to insert the tip of your mandrel in. Choose the size that best fits your annealer, 8" or 12" width. Depth measures 2½" between the perforated panels and 2½ behind the back panel for stability. 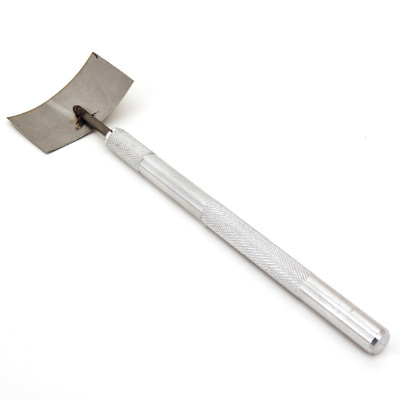 This Delux 30cm width x 6.5cm ht x 13 cm long, Deluxe KILN Mandrel Rest is the ultimate annealer accessory. 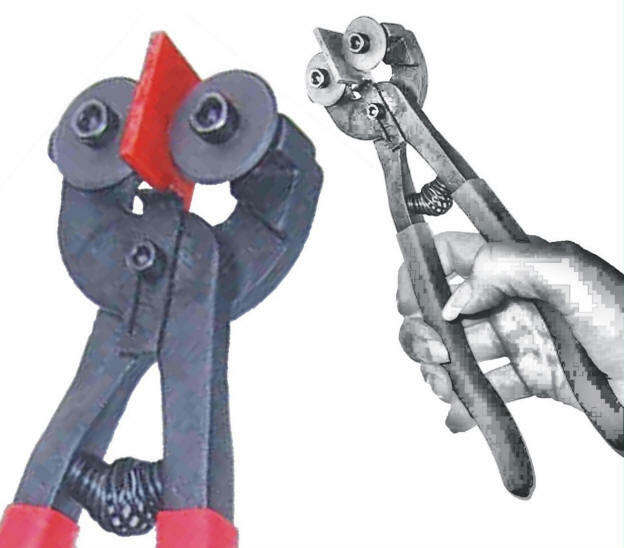 Bigger, better, and much tougher than the original mandrel rest while giving you up to twice as much mandrel capacity. Properly placing your beads in the annealer is a great way to avoid denting or the sticking of your beads. 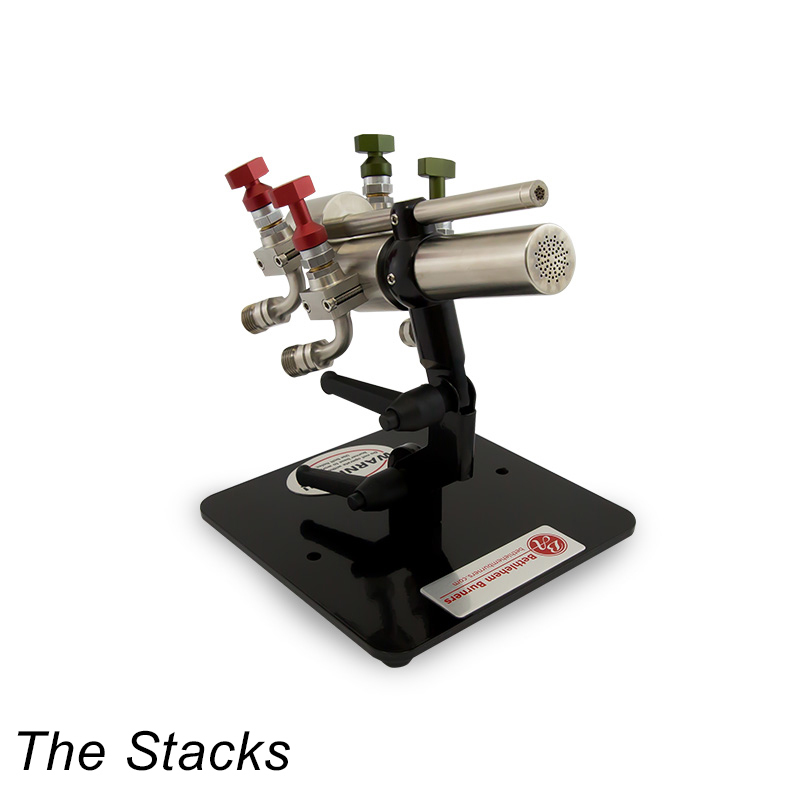 With a stable base and 2¾" height, the rack safely suspends all your beads, preventing them from touching each other or the annealer and becoming damaged. Use the front tier to rest your mandrel on, or choose the back tier, with its larger holes, to insert the tip of your mandrel in. Choose the size that best fits your annealer, 8" or 12" width. Depth measures 2½" between the perforated panels and 2½ behind the back panel for stability. IN STOCK NOW! OUR PRICE INCLUDES GST! Please note that payments made by credit card and Pay Pal on Oxy Cons incur a 1.5% additional fee. 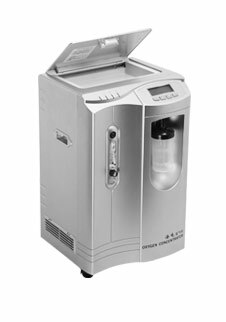 THIS MACHINE PROVIDES AN ECONOMICAL SUPPLY OF OXYGEN FOR INTRODUCTION TO BEADMAKING.... AND DISPOSES OF UNECONOMICAL HEAVY OXYGEN CYLINDERS...the pressure makes this Oxy-Con compatable with either of the new, state of the art, Bethlehem torches, both Alpha and Bravo models available at Beadglass. 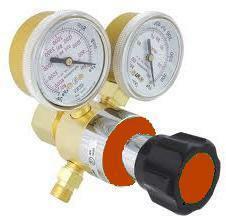 •Flow - it generates up to 8 lpm •Pressure - between 40 and 80 kPa (6 - 11 psi) •Purity - 93% (+-3%) not quite 100% so it won't be as hot as cylinder gas but plenty hot enough •Noise level - 48 dB or less •Power - 240V 10 amp •Power consumption - 480W •Digital display showing hours worked and current hours •Filter service - after 3000 hrs •Alarms - on overheating & power failure •Net Weight 30Kg. Gross Weight 32Kg •Wheels - castors. External Carton:42cm x 46cm x 74cm Please email for a delivery quote . Guarantee 18months. An unprotected or inadequately ventilated environment may cause damage which is not covered under warrenty.